Assessment of the gracefully bizarre warships from a technologically-young species which were upgraded and converted for a war challenging the vast Imperial Starfleet of Emperor Palpatine. Examines quantitative and qualitative features of several classes from destroyers through to commandships. The Mon Calamari are a species of amphibious sapients from the planet Calamari somewhere in the Outer Rim Territories. Their remoteness from major hyperlanes enabled their societies to develop in isolation from the greater galactic civilisation. The Mon Cals share their homeworld with another intelligent species, the deep-sea dwelling Quarren. Because of this example, few Calamarian thinkers could ever have assumed that their world and civilisation were unique in the universe. Even in their most primitive eras, it is probable that few Calamarians held any doubts about the possibility of intelligent life elsewhere in the galaxy. The history of Calamari was not spotless. Throughout the ages aggressive Quarren had waged war on the Mon Cals. The cycle of recurring conflicts ended only when the victorious Calamarians forcibly separated an entire generation of Quarren youth, educated them in Calamarian ways, and then returned them, fundamentally alienated, to their own kind. In time the grudging tendencies of the Quarren have diminished. The modern inter-species relationship is one of peaceful and inextricable interdependence. Mon Calamarians brought confidence, inspiration and calm idealism to the dual society; the Quarren contribute more pragmatic qualities. It was the Calamari who led their civilisation into deep space, with the explicit dream of discovering and joining with other intelligent species. Complacent but magnanimous victors of the relationship with their Quarren neighbours, it is possible that none of them held serious fears about the ways in which a real encounter with a superior technical civilisation might change or supplant their own comfortable order. After driving into interstellar space for several decades, the first meeting with humans was greeted with celebration. Calamari was swiftly inducted into the Galactic Empire, and recognised as a fine asset by Imperial government officials. Under the supervision and aid of the Imperial Forces, the planet's industrial facilities were upgraded and the population educated until they were brought into parity with galactic standards; a technological leap which must have been equivalent to at least tens of millennia of natural progress. The Calamarians learned to adapt Imperial technology to their own distinctive artistry; they integrated themselves with the galactic economy through the production of unique goods (including luxurious passenger starships) and high-technology materiel of all kinds for the armed forces of the Empire. Unfortunately, the human relationship soured quickly. The differential of power between the Mon Cals and the aliens was a severe anticlimax to long-cherished utopian dreams, and rudely disruptive to the established lifestyles of both the Calamarian species. For their part, the human local officials and governors developed dismissive and condescending attitudes. Calamarian civil disobedience was met with inflexibility and oppressive force, which served not to cow but to exacerbate friction and rebellious sentiment. At some point the antagonism took a brutal turn. The Mon Calamari and Quarren armed themselves for war and expelled the human presence from their space. Warships of the Imperial Navy subjected Calamarian floating cities to orbital bombardment. Since then, the Calamari somehow managed to keep the Empire at bay. Remoteness was a consideration, but there must have been a more significant deterrent. They may have mined all the hyperspace approaches to their system, so the local Imperial forces would not risk anything more than dispensible probe droid incursions. Nevertheless a human counter-offensive was inevitable so long as Emperor Palpatine lived. Calamarian leaders linked themselves with the Rebel Alliance, a motley collection of insurrectionist groups within the mainstream galactic community, ranging from grassroots terrorists to the displaced nobility of Alderaan. This sponsorship had many benefits: it bought time by distracting the Imperial Forces from mounting full-scale reprisals against Calamari; it bought the hope of establishing a new revolutionary galactic government which would be indebted to the Calamari. It was said that the human rebels were the arm of the Alliance, but the Mon Calamari were its soul. The Calamarians provided the rebels with sanctuary, a vast population base, impressive manufacturing facilities and shipyards. Most significantly, the Calamarians turned over the bulk of their starfleet for conversion to massive vessels of war. 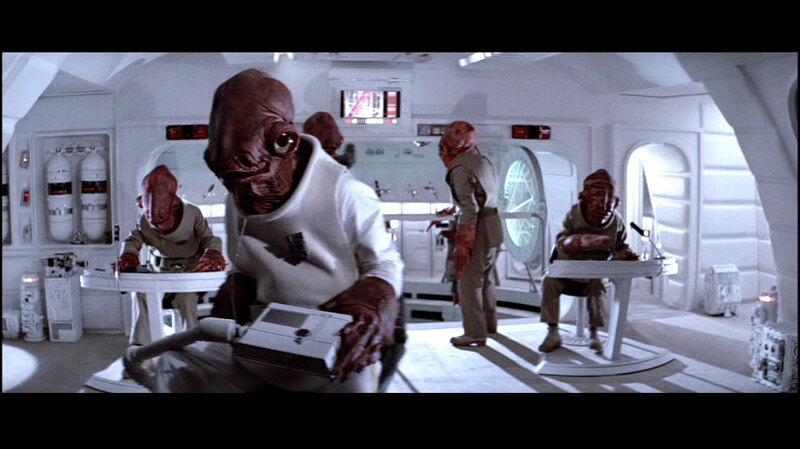 After early interaction with galactic civilisation turned out badly, the Mon Calamari became major (perhaps dominant) sponsors of a fifth-column movement in human space: the Rebel Alliance. Two warships of Calamarian design: the flagship Home One is below; a Liberty-type winged cruiser is at top. Home One was by far the bigger vessel. Two spacious docking bays are on Home One's port flank; one much smaller hangar can be seen near the Liberty's bow. Mon Calamarian transport ships lift off during a World Devastator assault on a Calamarian floating city. 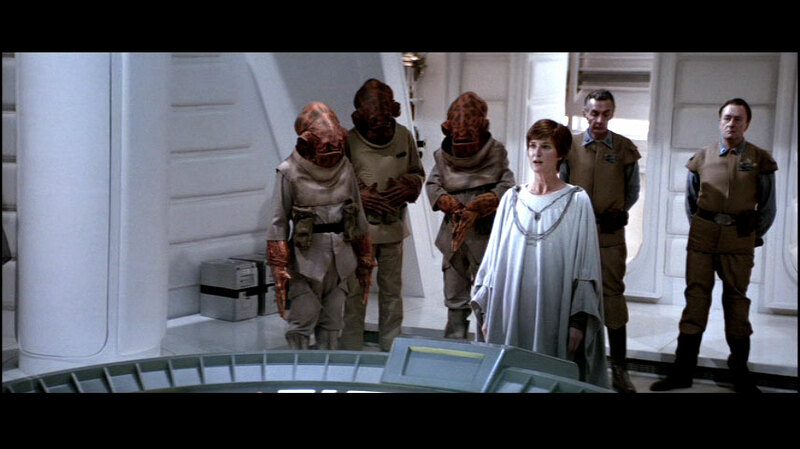 An assortment of Mon Calamari leaders giving their quiet support and sponsorship to former-Senator Mon Mothma in her war against Emperor Palpatine. The warships of the Mon Calamari are mixtures of Calamarian and human galactic-standard technology. The arrangement of the habitable interior spaces into layered parallel decks naturally accommodates the comfort of the two species, since humans and Mon Calamari both evolved in environments with gravity. The exterior aesthetics of Calamarian starships reflects the species' marine origins, giving emphasis to smooth, streamlined forms. The ships consequently look as if they're just as operable underwater as in deep space. On the other hand, human habits and influences are evident in the appearance of some of the hangar interiors and possibly the drive systems. 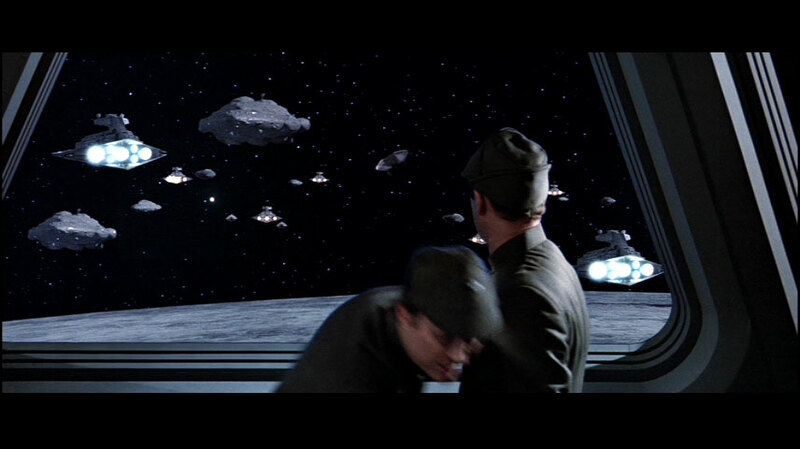 The weapons emplacements were cut into the hulls after entry into the Rebel Alliance; it is likely that the turbolasers and other guns were of non-Calamarian manufacture. Originally built as transport ships and grandiose explorer vessels, the general features of most Calamarian naval designs have not been influenced by combat considerations. The placement of some hangars is tactically awkward, like the configuration and mounting of many cannons. Some newer vessels were designed specifically for combat roles. Unfortunately these ships were not in action before the Battle of Endor, so they have not been documented in many (known) images and illustrations. It should be expected that the arrangement of cannons and other combat devices will be more uniform and symmetric on these newer ships, since they do not result from makeshift and constrained opportunistic modifications like the older warships. The degree of uniformity in Calamarian starship designs is a matter of debate. The game books from West End Games make statements on this topic, but include two opposed points of view. On one hand, the textual descriptions say that each Calamarian vessel is a unique work of artistic engineering; on the other hand the books describe discrete design classes such as MC80 and MC90. Identical statistics are attributed to all examples of these classes: including exactly identical physical dimensions, armament, shielding, propulsion and other capabilities. 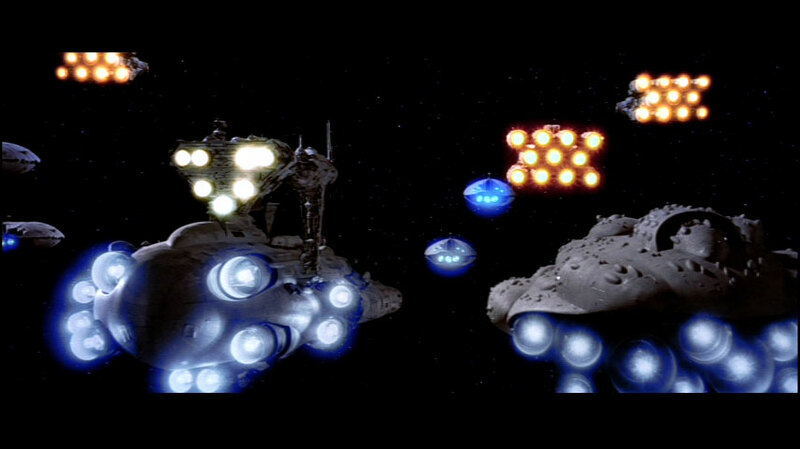 The evidence of Return of the Jedi explicitly shows that there were at least three different models of Calamarian warships at the Battle of Endor. However many of them were sister ships, sharing a common design. Small-scale features may have varied between these siblings, but not at levels of detail visible on screen. Variances could not be larger than a hundred metres or so without causing noticeable differences in the vessels' profiles. It is possible that the original forms of these vessels were as varied as some accounts describe, and the uniformity of design was imposed during the process of conversion for naval use. Most of the classes of Calamarian warships known to date are designated in the role of cruisers. The more powerful models should probably be called battlecruisers, battleships and commandships. These classifications are determined according to the role of the warships relative to each other. 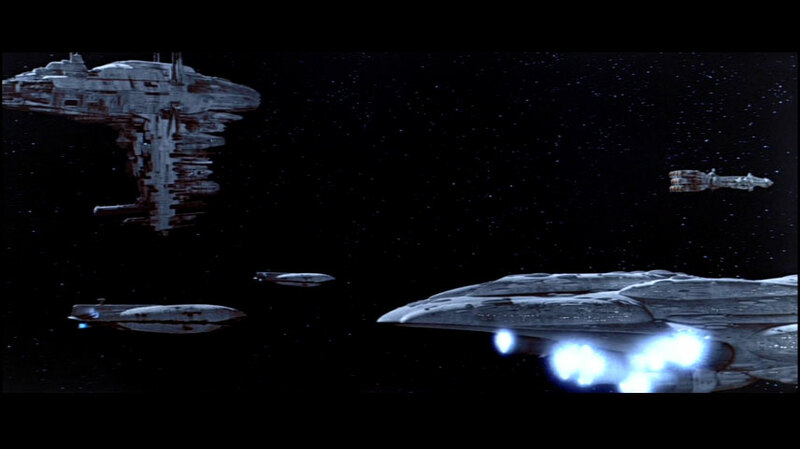 Since Imperial technology has a larger scale, a Calamarian cruiser may be smaller than an Imperial destroyer, and a Calamarian command ship may be comparable to an Imperial cruiser. 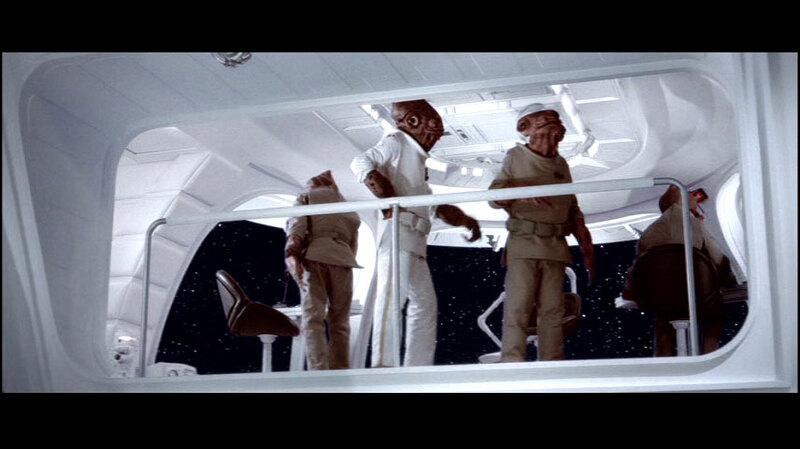 The Mon Calamari are reputed to construct many kinds of smaller vessels; their apparent absence from the Battle of Endor deserves explanation. Perhaps the Calamarian destroyers, frigates and lesser naval starships were on permanent duty guarding their homeworld against attack? Perhaps the conversion of Calamarian civilian ships to naval use was not finished: the engineers may have preferentially upgraded the largest available vessels to combat capability before treating smaller ones. The known classes of Calamarian warships, including those converted for battle-worthiness and those originally designed for combat, are briefly profiled below. Note that the names used for the various classes, where stated, are highly provisional. I adopt the name of the best-known example of each design, but there is know way to be sure that these are the official names used by the Mon Calamari. The real Calamarian names are likely to be very different. At the very least, they will be expressed in the primary Calamarian language. Warships scaled according to direct measurement, defined length or control pod comparison. 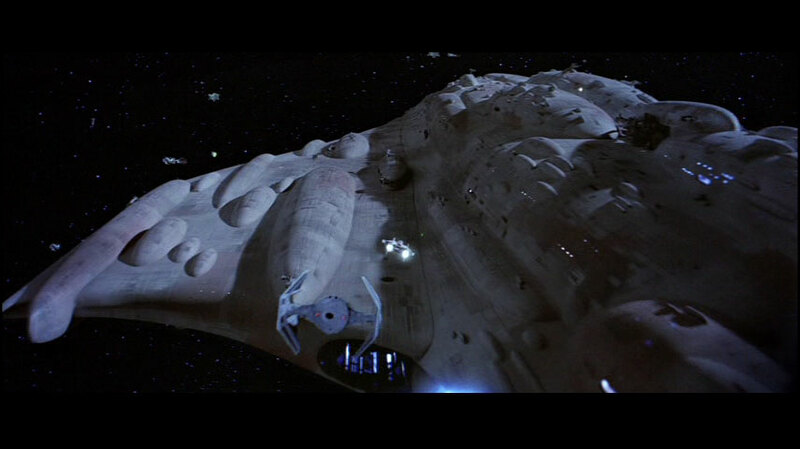 Images of Home One and the pearly cruiser from Return of the Jedi are photomosaics; there are no known photographs showing an onobstructed broadside view of either vessel. The destroyer and the 1300m cruiser are from computer game screenshots. 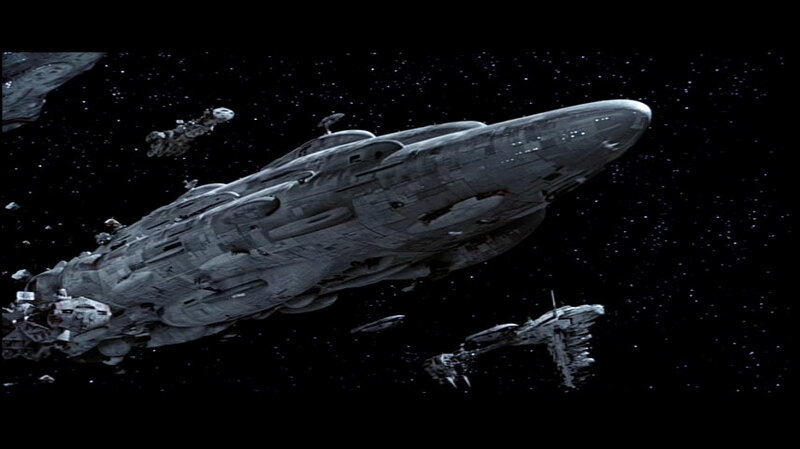 The Defiance silhouette is derived from oblique views of the ship in Dark Empire . The MC80a image is taken from Rebel Alliance Sourcebook ; it may not be the definitive illustration of this class but it is broadly similar to the details shown on the Naritus in Cracken's Threat Dossiers . Predominantly blue and grey hull plating. One large hangar aperture on starboard; two on portside. At least nine pods attached to fins on the hull. 29 turbolaser batteries; 36 ion cannons. This cigar-shaped design fulfils a battleship or commandship role in the Calamarian starfleet. ( Star Wars Trilogy Scrapbook: The Rebel Alliance describes it as a battleship, although it is misattributed a Liberty photograph.) 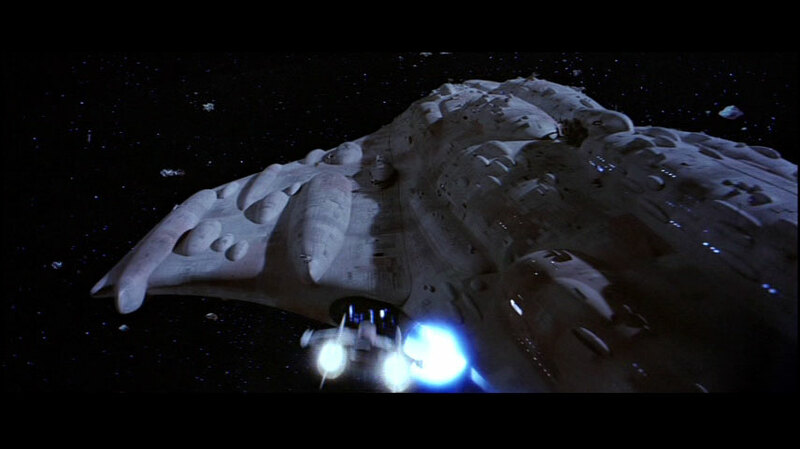 Home One, the archetype of the class, was Admiral Ackbar's personal flagship during the Battle of Endor. This prestigious warship was far larger than a commonplace, mile-long star destroyer of the Imperial Navy. The Home One design was rare as it was big: at least one sister ship fought at Endor, but smaller cruisers were more abundant. According to A Guide to the STAR WARS Universe : “Home One has twenty-nine turbolaser batteries, thirty-six mini-ion cannon emplacements, multiple shield and tractor beam projectors, and twenty hangar bays to house its complement of ten starfighter squadrons and other craft.” These statistics are credible since they apparently emerged in the book's first edition, dating soon after the release of Return of the Jedi , and predating the arbitrary inventions of roleplaying games. The counts may derive from direct inspection of the Home One model. The turbolaser armament of 29 seems small and odd. Maybe it is a transposition error from 92? Or, perhaps Home One's guns are few but heavy and powerful? “Twenty hangar bays” must be the total number of work bays within all three flank hangars. The name of this vessel is disputed. 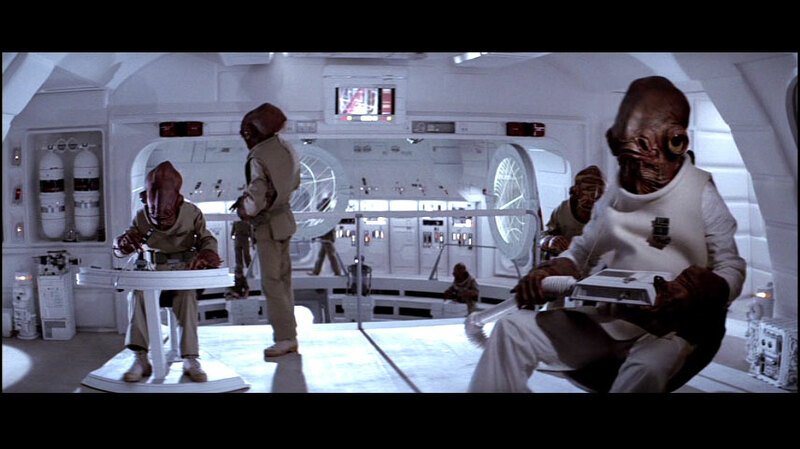 Some argue that “Home One” was merely Admiral Ackbar's individual call-sign during the Battle of Endor. 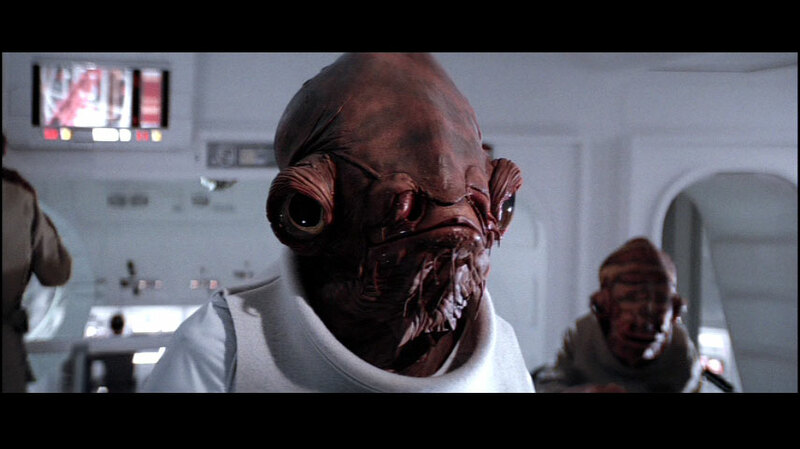 They say that Ackbar's pre-Yavin flagship, Independence, (name in the X-Wing computer game) was his Endor flagship. Others argue that “Home One” sounds consistent with Calamarian nomenclature and style, e.g. similar to the names of their cities. Yet another label was used in the Return of the Jedi novel: Headquarters Frigate. Unfortunately this name doesn't literally fit the ship, which is far larger than “frigate” scale. 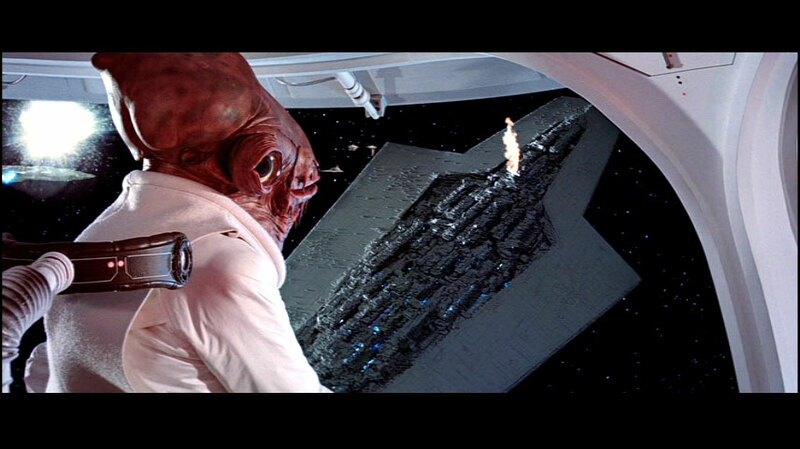 A Mon Calamari flagship named Independence appears in some computer games and comics. It may be the same as Home One, but this is unconfirmed. In The Truce at Bakura , Admiral Ackbar reverted to another, more comfortable personal cruiser. If that second ship is the Independence then the apparent discontinuity is resolved. Orthogonal views of the unlit Home One model, as shown in the Behind the Magic multimedia reference. Home One as it was first shown in the rebel fleet gathering near Sullust. Corellian corvettes (150m), stolen Kuati frigates (approximately 300m), and various medium freighters (approximately 90m) are dwarfed by the Calamarian leviathan. The rebel fleet prepares to make the hyperspace jump to the Endor system. Home One is to the left of the picture. The stern is rounded, and the engines number ten and are arranged with a strict bilateral symmetry. A sequence of views of the starboard side of a Home One class ship (with several foreground obstructions). One of the dorsal pods on what appears to be Home One. These structures may be bridges or observation posts; or they might be associated with sensors, communications or weapons. In any case, they must be associated with a function that requires a clear line of sight. What appears to be a representation of a Home One type of ship encountering an Imperial fleet in Balance of Power . Length possibly 1.2km – 1.5km? Predominantly red and white hull plating. Stern has overhanging dorsal and ventral fantails. Two (perhaps three) small hangar apertures on bow. Possibly includes ventral aperture like that of type-3. Differences of technological scale mean that although this ship plays the role of a battlecruiser or cruiser in the Calamarian fleet, it is actually smaller than many Imperial destroyer designs. The most distinctive feature of the Liberty is the pair of delta-shaped wings. At least one other warship design had a matching body without the wings. Aside from the addition of wings and the use of a different hull material, the Liberty-type cruisers sacrifice one sublight engine for a ventral engine cowl like a smaller version of the massive dorsal fantail hood which shelters the thruster bank from above. Like its wingless cousin but unlike Home One, Liberty has an ovoid ventral cavity which seems likely to be a docking bay. Rear view of Liberty, revealling some of the proportions, engine structure and the features of the trailing edges of the wings and fantails. Full-length exterior views of the Liberty type of Calamarian cruiser. 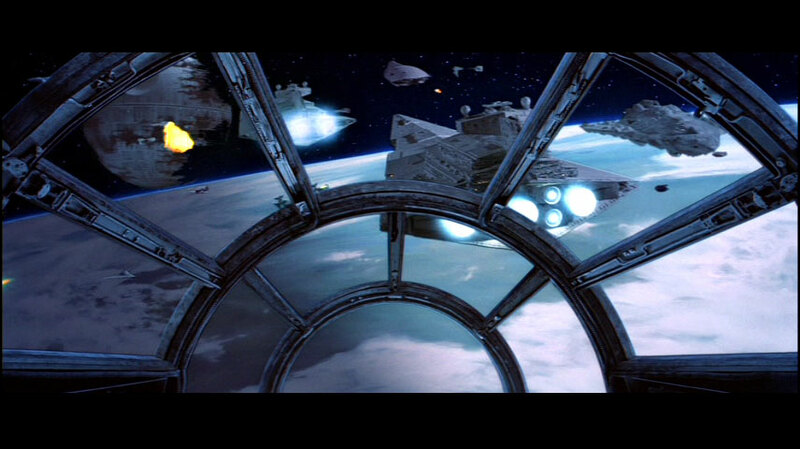 Liberty-type cruiser in background behind what appears to be Home One, as the rebel fleet scrambles to evade impacting on the Endor security shield. Views from above the portside wing. There is a blue-lit hole in the trailing edge of the wing, extending outboard from the cavity containing the thruster banks. The hole in the wing however does not contain any engines; it may contain a special sheltered hangar or some other functional but sensitive feature. Liberty schematics according to Essential Guide to Vehicles & Vessels . The model originally used to depict the [anonymous wingless] cruiserswas altered to make the Liberty design: they altered the engine array and added wings. A winged Mon Calamari cruiser depicted in X-Wing: Alliance is 1.5km long and has some resemblence to the Liberty. However the number and configuration of engines differs. Wingless analogue of Liberty design. Stern has overhanging dorsal fantail. Flank hangar configuration poorly known; 1 bow notch (maybe hangar?). Oval ventral aperture, off-centre on starboard side, amidships; may be a docking bay. Similar to the Liberty class but lacking the wings. One additional thruster and reduced mass (no wings) must make this a faster ship. This vessel's role is probably that of a cruiser. With at least four representatives, this was the most common Calamarian design seen at the Battle of Endor. There is an unconfirmed possibility that this class is the common Calamarian cruiser identified as the MC80 in other references. On the other hand, it resembles the later MC90 more than other ships, which may imply an intermediate class. Ventral views, concentrating on the stern. A stern view almost directly along the cruiser's axis [lower right corner]. The engine arrangement is explicit. Long-range transverse views of the stern. It is very similar to the stern of Liberty, except for the replacement of the latter ship's small ventral fantail with an extra thrust cylinder. Rare forward view of the wingless cruiser model, from an angle about forty or fifty degrees above the ship's deck plane. From July 1983 issue of CINEFEX . A dark marking on the starboard bow is either a large weapon emplacement or a small hangar. Long-range view of the bow, sighting directly along the cruiser's axis. This view is useful for determining the ship's basic proportions. 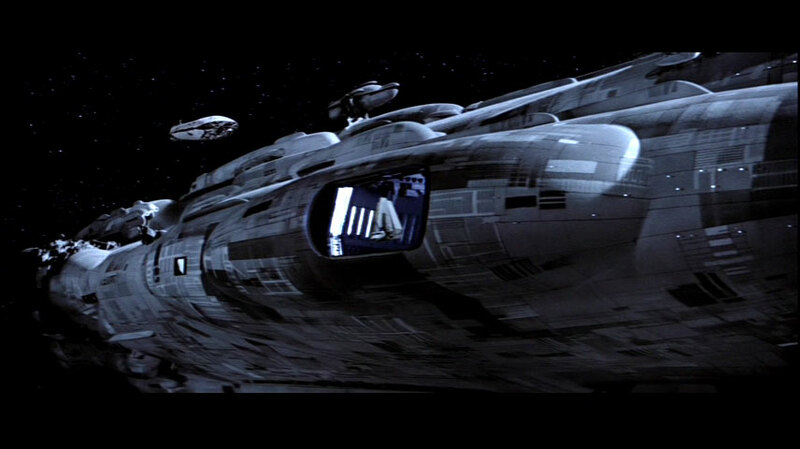 Newer star cruiser appearing after Return of the Jedi , its capabilities and dimensions are similar to those of the MC80. Unfortunately we do not yet know which (if any) of the designs at Endor is the MC80: the Liberty or its anonymous wingless cousin. If we knew that identification then we would have some idea of what the MC80a looks like. 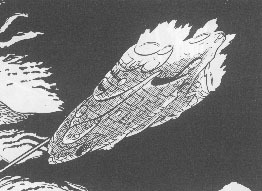 There is one low-resolution, stylised image of a MC80a in Cracken's Threat Dossiers , this probably serves as a fair hint at what the real ship looks like. Statistics in the X-Wing Official Strategy Guide and in the game's internal databases suggest that the ship in this simulator game is the MC80a, despite the fact that the story is set before the Battle of Endor. NB. the cruiser seen in X-Wing is different from the two classes of Calamarian warships seen in TIE Fighter . Adding to the inconsistency, the distinctive 1300m cruiser in the later games is also named MC80a. The statistics for X-Wing 's putative MC80a are transcribed in an appendix, and the visible features are discussed in the next subsection. 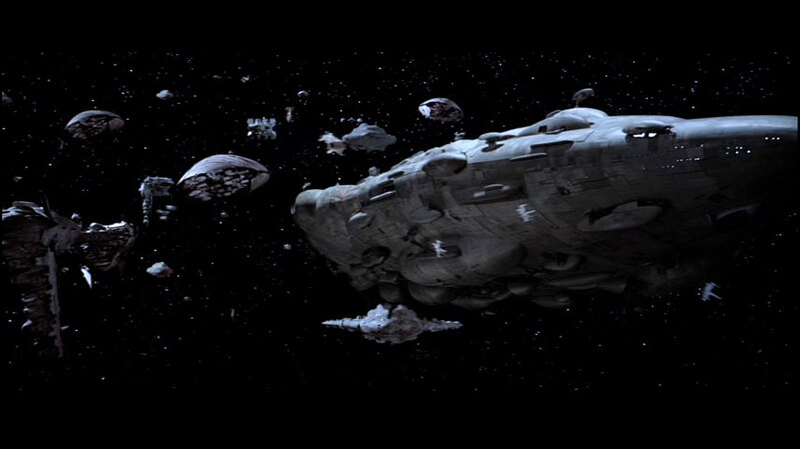 The cruiser Naritus participated in the evacuation of doomed planets in the Corellian Sector attacked by the Starbuster Plot, fourteen years after the Battle of Endor. A cruiser of Calamarian design, as drawn in the Rebel Alliance Sourcebook . The corresponding game statistics are labelled “MC80a”, although this particular model was supposedly not in use until after the Battle of Endor. This sourcebook was set before The Empire Strikes Back . In any case, the drawing resembles the Naritus in several respects, so it really might be a MC80a despite the anachronism. Yet another totally different cruiser called MC80a, from X-Wing: Alliance . This one is 1.4km long, has a silvery hull, is slightly winged and has four engines and a rounded stern that are vaguely similar to a dramatically downsized version of the aft end of Home One. 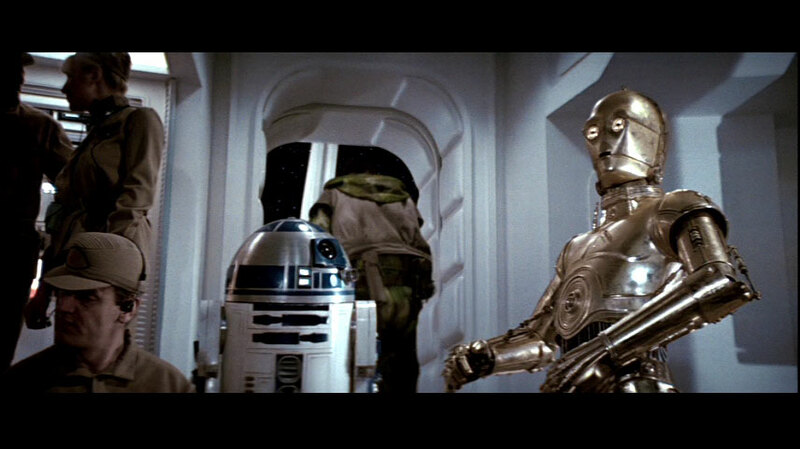 Its presence in a pre-Endor computer game means that this “MC80a” cannot be the same model as the roleplaying game's MC80a, which is strictly post-Endor in construction. This tubular cruiser has two command pods, which is intermediate between Liberty (zero) and Home One (at least half a dozen). Beige and grey hull plating. Three thruster nozzles in single bank. One large hangar along 21% of ship's length, on starboard bow. Possibly a smaller ventral aperture, portside amidships. 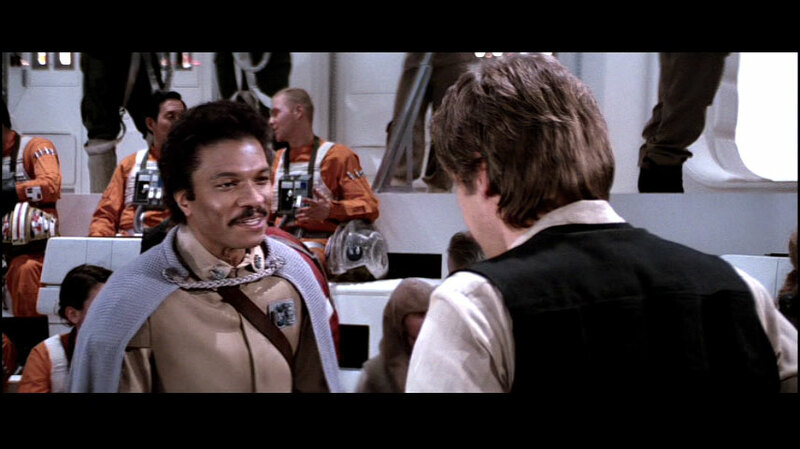 Acted in cooperation with rebels since before Battle of Yavin. The hull is plated with panels in various hues of beige or grey. The form of the ship is like that of a flattened tube, with symmetric lumps on the port and starboard edges like miniature wings. There are three equal-sized cylindrical thrusters in one bank on the underside of the stern. The main hangar region on the starboard side is remarkably wide: about 260m across, which is over a fifth of the ship's length. That should provide a rapid launch rate for the fighters (perhaps dozens at once), or else an ability to dock corvette-sized vessels. However the aperture would be an extreme, gaping point of vulnerability if ever the shields should fail. The numbers for this class of vessels are given under the heading “MC80a” in the statistics section. Various views of the “MC80a” from the X-Wing computer game. Greatly enlarged fantail vertically subdivides thruster bank. Ten or less cylindrical thrust nozzles in single bank? Supposedly from 48 to 96 starfighters supported. Produced 1.5 years after Battle of Endor. This ship is described as a “heavy assault star cruiser”, which probably means that it is a battlecruiser. Intermediate between the converted MC80 cruisers and the combat-dedicated MC90 design. Not a entirely new design, rather the MC80 naval modifications are taken to a greater extreme for improved utility as a warship. Manufactured as early as 1.5 years post-Endor. Mon Remonda was an important participant in the first campaign to capture Coruscant, and also served as Han Solo's flagship in his hunt for Warlord Zsinj, which culminated at the Battle of Selaggis and the crippling of Zsinj's Iron Fist. The fact that its roleplaying game statistics omit tractor beams probably means that it lacks conventional hangars. This would be a reasonable modification for a vessel intended to take the extreme brunt of heavy combat. Personnel and supplies would transfer through retractable boarding tubes linking temporarily with another vessel or facility. Nevertheless Essential Guide to Vehicles & Vessels claims that the early MC80B ships carried four squadrons of starfighters, and later versions carried eight squadrons. Perhaps the fighters are propelled from rudimentary launch ports but must be collected by other (tractor-capable) motherships after battle. The schematic drawing in EGVV shows that the starboard side doesn't have any hangars; at least not hangars large enough to fit a fighter. 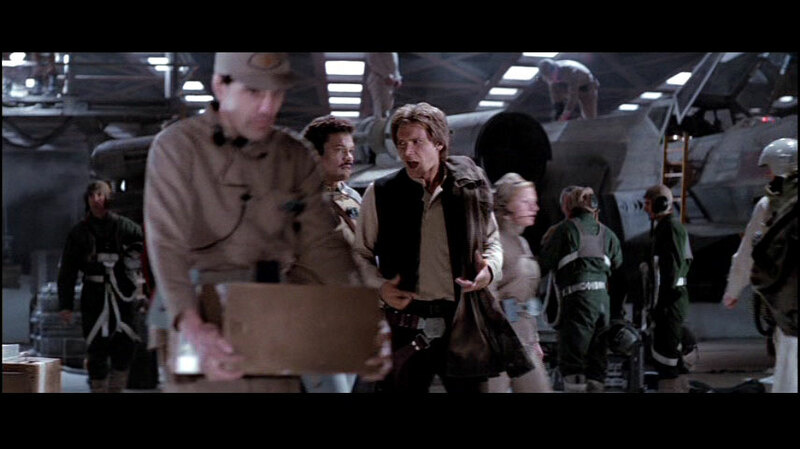 However the novel X-Wing: Iron Fist describes a single portside hangar. Clear drawings of the Mon Remonda, from Essential Guide to Vehicles & Vessels . Mon Remonda, as drawn in Cracken's Threat Dossier . Caveat: the style of the book's artist makes even the human-designed Republic-class star destroyers, which are successors to the Victory-class destroyers, seem rounded like a Calamarian vessel. At least eleven cylindrical thrust nozzles in main bank; two in secondary outboard banks. At least one portside ventral hangar. One dorsal pod; 2 ventral pods. Produced 5.5 years after Battle of Endor. The MC90 Defiance was the first Calamarian cruiser purposely designed as a warship, and came into service 5.5 years after the Battle of Endor. It has improved shields, propulsion, power generators and weaponry. Six fighter squadrons are carried, and one docking bay located on the port side is known to date. Spacecraft systems are more standardised among ships of this class, and the displays and controls have been adapted to be operable by other species. Several MC90 ships participated in the Second Battle of Calamari. The name Defiance was also used for another crusier of an older model, as shown in X-Wing: Alliance , which took place before the Battle of Endor. 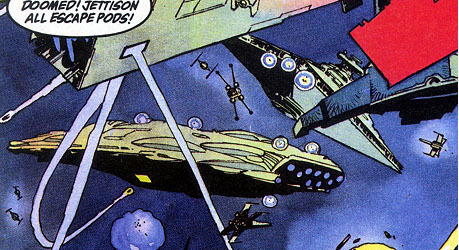 The two ships should not be confused; obviously the Mon Calamari reuse their ship names sometimes. Perhaps the earlier Defiance was destroyed or decommissioned before the completion of the first MC90. Defiance in orbit around Da Soocha, an unexplored sanctuary world in Hutt Space, during the tumultuous year of the Palpatine Clones of Byss. 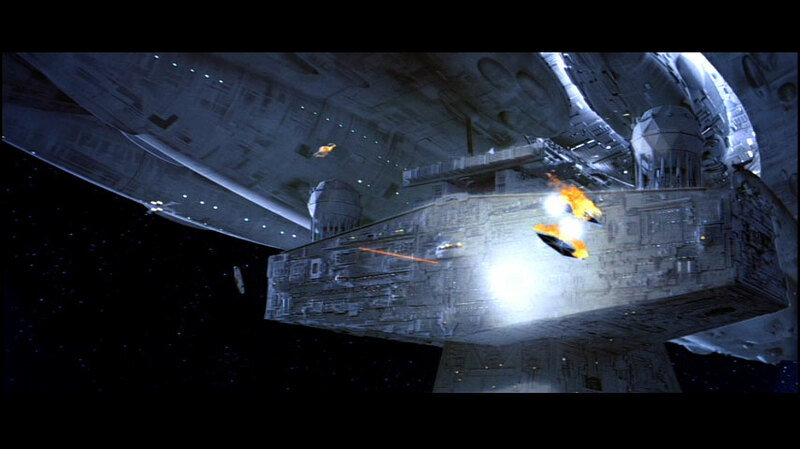 Another MC90 fending off an Imperial counter-attack and collecting escape pods during the Battle of Calamari. Galactic Voyager defending the secret New Republic base at Anoth. This ship has been described as being in the same class as Defiance, but its shape, at least in this illustration, is radically different. Observe the difference in stern structure, in particular. 3 Cylindrical thrust nozzles in main dorsal bank at stern, plus 2 cylinders in ventral bank amidships. At least one flank hangar, carrying at least 3 squadrons. Produced no later than Battle of Hoth. 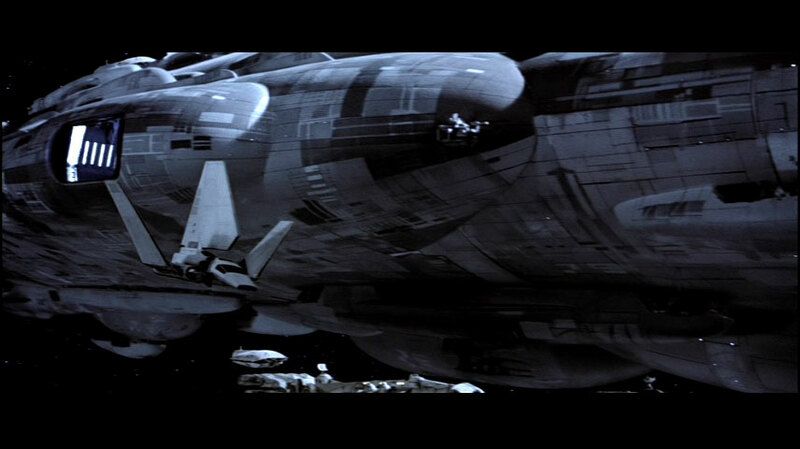 The major Calamarian cruiser seen in the computer game TIE Fighter is quite different from those seen at the Battle of Endor. It is slightly longer than the MC80 series, and has an elliptical, winged design. Engines are placed amidships in dorsal and ventral clusters as well as at the stern. This is vaguely like the available drawings of the MC80a, but there are differences: the 1300m ship is more slender and the wings are further back. Technical schematics for the 1.3km cruiser, according to the intelligence available to Imperial starfighter pilots. These images show data profile, portside, stern, starboard side, dorsal and ventral views respectively. Data entry depicting the 1300m cruiser X-Wing vs TIE Fighter . This ship is identical to the one in TIE Fighter , but it is confusingly named MC80a. This is a problem because it is inconsistent with the shape of the MC80a seen in earlier roleplaying game references, and with a 1.2km ship described as MC80a in the internal statistics of the original X-Wing computer game. Design remiscent of a downscaled version of 1.3km anonymous cruiser. One central ventral thruster at stern, plus two cylinders on either side of a dorsal bank amidships. Portside flank hangar, carrying 1 squadron. One small dorsal bow command pod. The TIE Fighter campaigns and training missions involve what presently is the smallest presently known type of Calamarian warship. They are described as “light cruisers”, but the extreme difference of tonnage between this ship and the regular star cruisers suggests that designation as a “destroyer” might be more appropriate. The ship is 500m long in TIE Fighter and X-Wing: Alliance and 505m long in X-Wing vs TIE Fighter . According to the latter game, it has 35 gunners, 650 troops, 3723 crewmen, and supports one fighter squadron. The vessel's alphanumeric Calamarian class is “MC40a”. Schematic representation of the Calamarian destroyer according to Imperial sources. Technical data, starboard side, portside, dorsal and stern views respectively. Data entries depicting the MC40a in X-Wing vs TIE Fighter ; and X-Wing: Alliance . The second image shows the engines, command pod and hangar bay explicitly. Silvery hull plating, areas painted red. No protruding command pod; bridges appear on dorsal hull. Produced before Battle of Endor. This warship, dubbed the “MC30c frigate” [ Empire at War: Forces of Corruption ] appears smaller than the Mon Calamari cruisers that visibly participated in the Battle of Endor. Judging by the portals, the main inhabited sections are in the rounded armoured head. The top of the stern is covered by a fin of similar armour. The thin connecting mass between the tail and the main body appears less well armoured, and has a darker, lightless texture reminiscent of main starship componentry. It probably contains parts of the reactor or drive systems. There are no raised command pods, but possibly some bridge windows at several points along the dorsal line. There don't appear to be any hangars on the starboard side. The ship seems to have cylindrical thrusters; at least one of the nozzles is near the lip of the frontal armour. 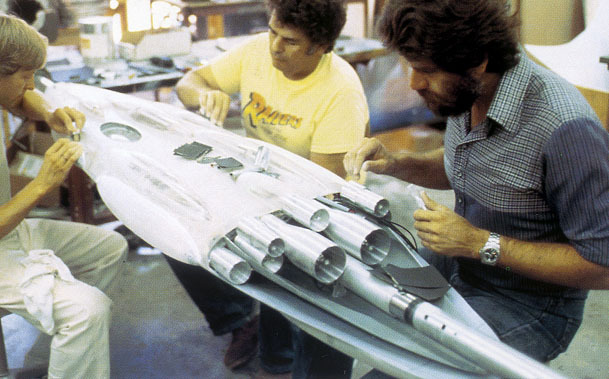 Extratextually, the MC30c appears to be an interpretation of a ship conceived for ROTJ but omitted from the final film. The likely basis illustration appears in STAR WARS to Indiana Jones: The Best of the Lucasfilm Archives . The “c” in the designation “MC30c” implies that this frigate may be a subtype in a series of frigates prefixed with “MC30”. Rendering of the MC30c star frigate from Empire at War: Forces of Corruption . Portside and top views of a Mon Calamari vessel that didn't appear in ROTJ , but closely resembles the MC30c frigate. [ SW2IJ ] This design is very slender; perhaps it is a fast and light vessel, like a destroyer or frigate? No scale cues are obvious, though there may be some broadside gun grooves. Broad stern and widely spaced thrusters. At least two thruster nozzles. This warship has a broad front section and widely spaced thrust cylinders. There are at least three control pods: two are near the stern in opposite dorsal and ventral positions; another one is amidships on the starboard side. Given that one of the pods must contain the bridge, they might serve as an approximate yardstick for size comparison with Home One. Judging by this measure, this ship could be intermediate between the 1.2km MC80 and the 3.8km Home One. The hull plating is coloured yellow-grey. There are no obvious hangars on the portside or dorsal surfaces. Orthogonal views, side and top, found in From STAR WARS to Indiana Jones: The Best of the Lucasfilm Archives . Single thruster bank at stern. Slight fantail and small wings. This wingless battlecruiser design, drawn from two perspectives, has the benefit of a direct scale indicator. It is approximately one mile long, which is 1609 metres. 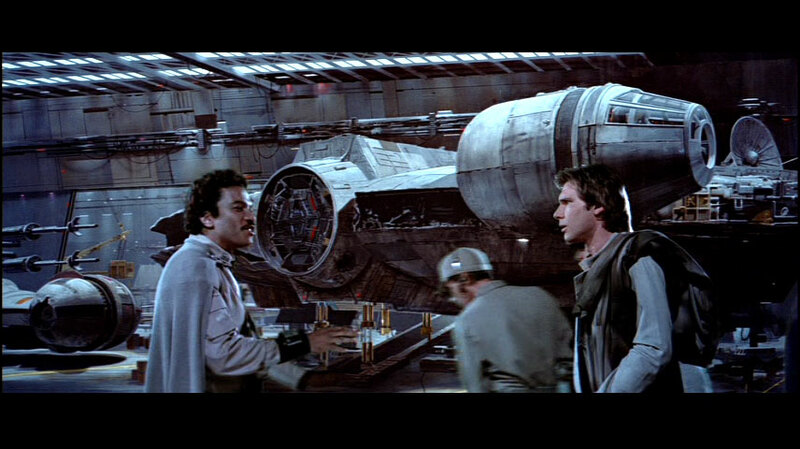 The hull is smooth and the wings are very small; in form it is closer to the pearly wingless cruisers at Endor, though it seems to be very much larger. There is a depressed area with rough texture on the underside behind the bow. The character of this section of the ship is distinctive and its function unknown. Along the midline there seem to be several weaponry notches, but there are no hangars on the side which has been pictured. Various views of the mile-long Calamarian cruiser. Interrupted hull plating near the stern. One command pod above stern. 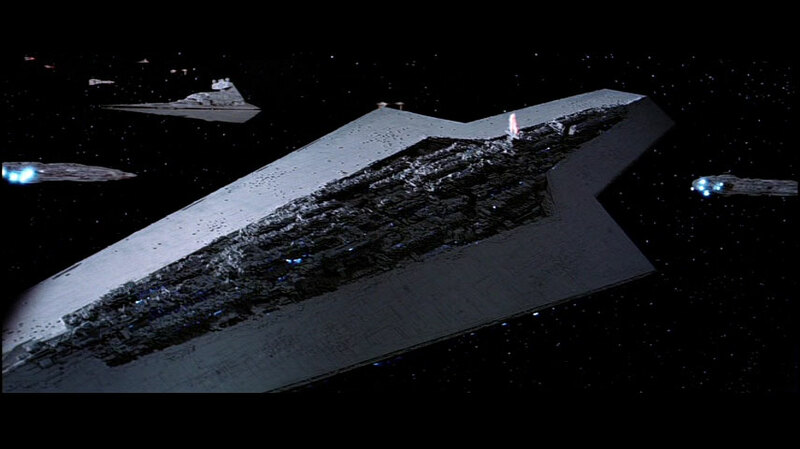 Another ship with an explicit one-mile length, shown to scale with an Imperator-class star destroyer. Some of the features are similar to those of the narrow, ray-like craft detailed below, but this might be just a coincidence. The thin tail section is less extensive and there is a control pod near the stern. Engines are hidden under a fantail hood. Considerable portions of the ventral and aft surfaces are poorly armoured compared to the rest of the ship. The general aesthetic of the ship and the position of the control pod are curiously similar to the Gallofree medium freighters shown in The Empire Strikes Back and mingling with the rebel warships in the final version of Return of the Jedi . Size comparison diagram from Return of the Jedi Sketchbook . Possibly several small broadside hangars. Thrust nozzles distributed over at least four positions. This warship has at least two control pods in dorsal positions on the midline. One is far forward at the bow, the other is closer to the stern. The engines are numerous and some of them are exposed to the sides, and they are spread at several different distances along the hull. They may constitute several distinct thruster banks, or they may be positioned in an essentially unclustered way. The main hull extends aft past the thrusters, along the midline of the ship, and it is possible that this feature cuts all the way from one side to the other, separating the engines into dorsal and ventral banks. Direct side view, taken from production art in Return of the Jedi Sketchbook . Armour continuous except small thruster cavity. One dorsal command pod near stern. Possibly short wings extending beside thrusters. This ships is the last of the distinctive models of Calamarian warships which were archived but lacks an official name. This particular vessel hasn't enough visual cues or yardsticks to enable definitive scaling. Without some idea of the sizes of this ship, its role is difficult to guess. Bulky-looking, flat-nosed, unscaled warship. There are slight, backswept wings and a dorsal fantail covers the engine cluster. There is one control pod near the stern. Length over a mile, almost 8.5km? At least one docking bay. Vector Prime describes the Mon Calamari battlecruiser Mediator, which belongs to a class that is considered new twenty years after the Battle of Yavin. Its designation as a battlecruiser implies greater power and size than the Liberty-type cruisers in ROTJ , and perhaps approximating Home One. It is reported to be almost half the size of Viscount; implying a length not much less than 8.5km. Not much detail is given, except for recognition that there is at least one docking bay. Rounded stern similar to Home One. At least 2 oversized dorsal command pods. A vessel of exceptional size and novelty described in Vector Prime . The first example seen in the literature, the Viscount, is refered to as “Mon Calamari Star Defender”, which is an odd term and may be colloquial or propagandistic. Functionally, because of its size, the vessel must be a kind of battleship. Viscount was substantially larger than a battlecruiser, which should be appreciably larger than a cruiser or destroyer. Viscount ought to be appreciably larger than Home One, which is nearly 4km long. It is over double Mediator's size, which itself must have matched Home One at least. 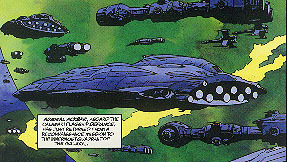 This novel evidence implies that Viscount exceeds 6km length, and may compete with Kuat's star dreadnoughts like Executor (about 19km long). An article previewing the Starship Battles game states that the Viscount is indeed such a behemoth: 17km in length and (judging by its fatness) a mass similar to Executor. The article states that the New Republic built Viscounts after learning a lesson from the Black Fleet Crisis . They desired a dreadnought able to compete with an Executor. 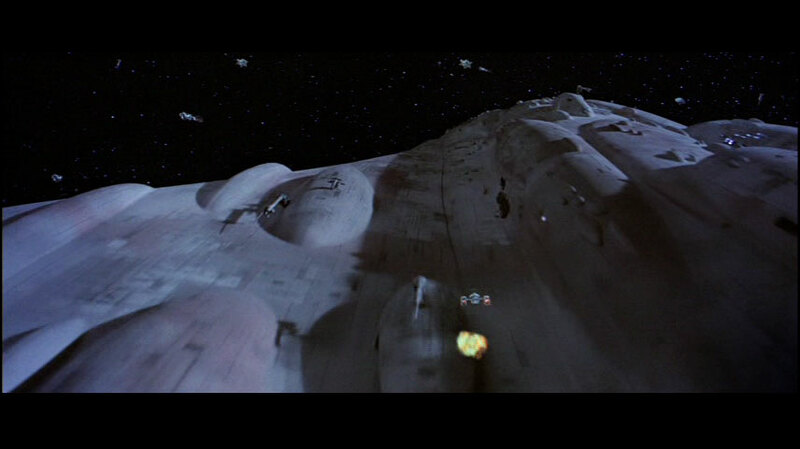 The ship is attributed 216 fighters (3 wings), which implies that it has docking bays somewhere. These have not yet been located in the available images. The ship has two dorsal command pods, which scale as considerably larger than those of Home One (being a similar fraction of the larger ship's length). The centre of mass of the Viscount is well to the front; the hull is a vaguely teardrop shape with the point being the tail. Apocryphal Note: Arkady Hodge, claims that in the 1980s someone wrote fan fiction dealing with the post- ROTJ era, which was called the “Restored Republic.” This story invented the term “Star Defender” for destroyer-sized vessels; a peculiar pun. This idea may have percolated to R.Salvatore, perhaps through the recesses of the roleplaying game references. It might also be just a coincidence. 4 major, 2 minor engines in a single bank. A star cruiser that escaped an attack on Mon Calamari by General Mohc's experimental darktrooper battle droids [ Sandblasted ]. The crew were killed by a lone darktrooper boarder, and the ship crashed on Tatooine after exiting hyperspace. As its name suggests, this vessel has grey hull panels. The hull is wingless and roughly tubular. There is a single control pod towards the aft end of the dorsal surface; it probably contains the bridge. 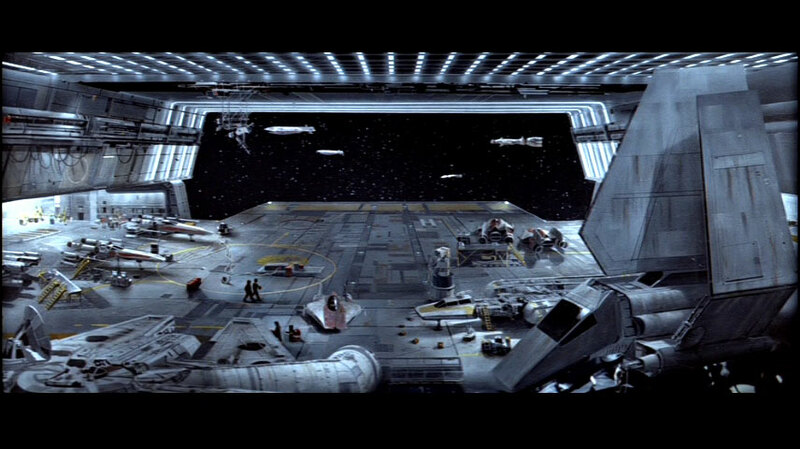 There is one hangar bay on the starboard side; its length is a significant fraction of the overall ship's length. The engines operate at a temperature giving their nozzles a yellow thermal glow (five or six thousand degrees Kelvin). There are four major engines in a cruciform arrangement within a single bank, and possibly another two minor engines above the port and starboard main engines. Last flight of the Grey Damsel, as seen in Sandblasted . The dimensions of Mon Calamari starships are extremely difficult to determine from the usual photography. The lack of straight lines and right angles means that there are very few points of reference. 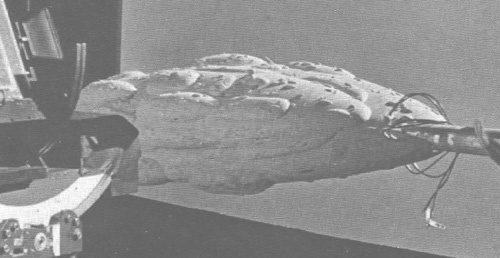 Throughout the whole STAR WARS saga, ILM modellers seem to have shown a preference for the classic scales used in traditional warship modelling, eg. using 1/620 (as with some older commercial kits) for the destroyer Avenger (length 1605.8m) and 1/6200 (a natural multiple of the former) for the star dreadnought Executor (length approximately 17484m). The Calamarian ships appear to have been built for comparison with the Imperial star destroyers, so perhaps they use the same scale as a convenience. Keeping consistent scaling would minimise the complexity of the multi-element composite shots which characterise the Battle of Endor. 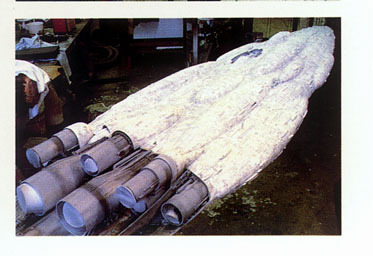 Both Calamarian warship models constructed by ILM are believed to have been 2.44m long. If the scale is the same then both of the Calamarian cruisers may be about 1512.8m long. The commonly-published length of 1200m implies a model scale of 1/492, which would be unique and eccentric. However a length of 1220m involves another traditional modelling scale, 1/500. Arguments based on the scaling conventions illuminate this subject well, but still need to be corroborated with photogrammetry from the movies. Exterior views of Home One at near-range, showing the ship's full length, on port and starboard sides. The first image centres on the starboard hangar, from which the stolen Lambda-class shuttle launched. Exterior views of the winged Calamarian cruiser, the Liberty's design. 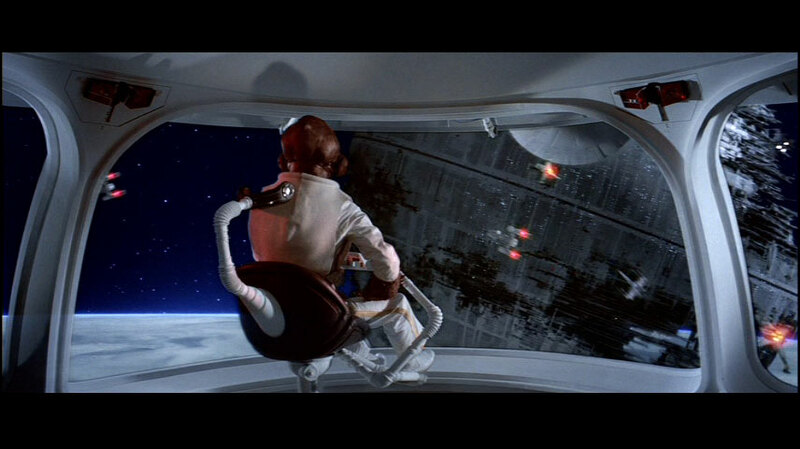 Home One, which was Admiral Ackbar's flagship and launched the Endor commando team, had several hangars with features suitable for measurement. There are two known portside hangars, which are often left unlit and inactive. The single starboard hangar is known from both internal and external photography. The dimensions of the hangar mouth in absolute units are determined by either the internal view or the exterior views of the shuttle launch. Combining these independent results with the proportions of the hangar seen on the outside of the ship indirectly places limits on the total length of Home One. Studying the launch of the stolen Imperial shuttle (height 22.25m) yields lower and upper bounds on the hangar aperture's dimensions. The lower bound comes from the image in which the shuttle is behind the aperture, still barely inside the hangar. The upper bound comes from the image in which the shuttle has just emerged and is slightly closer to camera. By this method, the hangar mouth is somewhere between 27m tall by 106m wide and 39m tall and 153m wide. Parallel lines on the hangar deck and a technician servicing and A-Wing starfighter are yardsticks in the internal views. 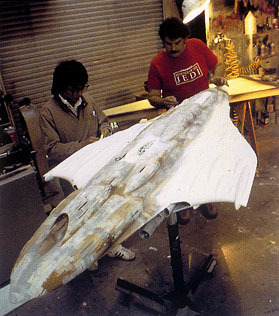 The published dimensions of the A-Wing special-effects model are 60cm x 40cm x 22cm, and the scale of the model is 1/16. Thus the A-Wing is 9.6m long and 6.4m wide. Using the A-Wing width as a yardstick, the crewman standing near the A-wing turns out to be just under two metres high, but he seems to be standing on a short stool. The width of the pair of tracks on the deck is 11.6m. The track can be used as a reference for dimensions of objects further away. A platform extends from the deck at the mouth of the hangar. According to the A-wing scaling, the platform's base is 83.2m wide, and its outer edge is 80.3m wide. The hangar aperture is 27.2m high, which is quite sufficient for the shuttle Tydirium to fit through. At its widest, the hangar interior is 107m. This aperture is just an inner lip to the hanger; the edges of exterior hole in the hull are slightly wider. If a perfect, long-range, 90-degree starboard broadside view of the ship existed then it would be easy to then use the known hangar as reference for the dimensions of the whole vessel. Alas, no such image is yet available. The best images of the whole ship are taken at about forty or fifty degrees from the bow-stern axis, well above the midplane and from a vantage point which is very much closer to the bow than to the hangar. Perspective effects along the length of the ship are very severe, invalidating the use of these pictures for photogrammetry. Fortunately it is possible to build a useful photomosaic of Home One from the Millennium Falcon's fly-by immediately before the rebels' departure from Sullust. Frank Gerratana has built a suitable composite image. Although the starboard hangar is obstructed by a foreground transport ship, it is possible to see the edges of the hull blister into which the hangar is built. According to other images the length of the hangar as a fraction of the length of surrounding hull blister is 0.217±0.008. The length of the blister relative to the whole vessel (in the photomosaic) is 217/1357. Therefore the hangar width is 0.035±0.001 times the length of the entire ship. Dr David West Reynolds has provided precise measurements of the original Home One model. The overall ship's length is 239.0cm, and the hangar's hole in the hull is 8.2cm wide at the widest point. The base of the platform is 5.4cm and the edge is 5.0cm wide. The hangar width measurement agrees exactly with the photomosaic result. Using the figures for the hangar platform based on the interior picture and the ILM model yields an absolute length of 3.84±0.08km (according to platform edge) 3.69±0.08km (according to platform base). These ranges are overlap; an appropriate combined result is 3.76±0.10km. The length of Home One is somewhere between 3.7km and 3.9km. The lower limit obtained using the Corellian corvette as a yardstick [below] falls within the range permitted by the shuttle results. The shuttle-based limits agree with the independent result from the scaling of the deck platform and A-wing fighter. The exterior width of the hangar hole in the hull is about 20% wider than the hangar interior, which is consistent with what is seen on the model. Important interior measurements in the starboard docking bay of Home One. Interior views of the starboard hangar of the Calamarian flagship. Exterior views of Home One's starboard hangar as the shuttle Tydirium launches. Storyboard sketch of the same event. Exterior image of the entire ship, with the hangar brightly lit. Photomosaic of the full length of Home One, as constructed by Frank Gerratana. Portions of the Alliance flagship are obscured by parts of smaller ships, but the main features can be discerned and the segments match flawlessly. These images open the possibility of another method of measurement. The portals at the prow of Home One must have a vertical separation of at least one deck interval (five or more metres). 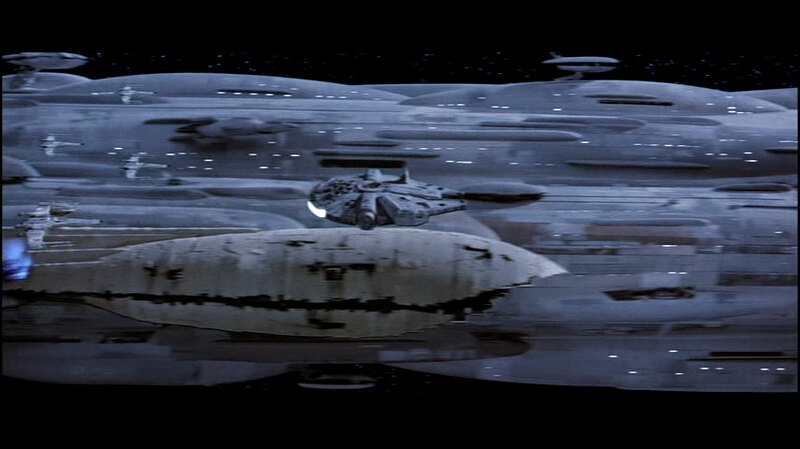 Immediately before the launch of the rebel fleet from Sullust to Anoat the camera view sweeps along the length of one of the large Calamarian ships. Between the stern and the viewer there is a Corellian corvette. The corvette appears to be closer to the cruiser than the camera, so both ships will have similar perspective scaling. The visible section of the Calamarian vessel is, as an absolute minimum, 4.7 times the length of the corvette; almost exactly 700m long. Since this doesn't appear to be even half of the length of the ship, the total length is likely to be more than a mile. 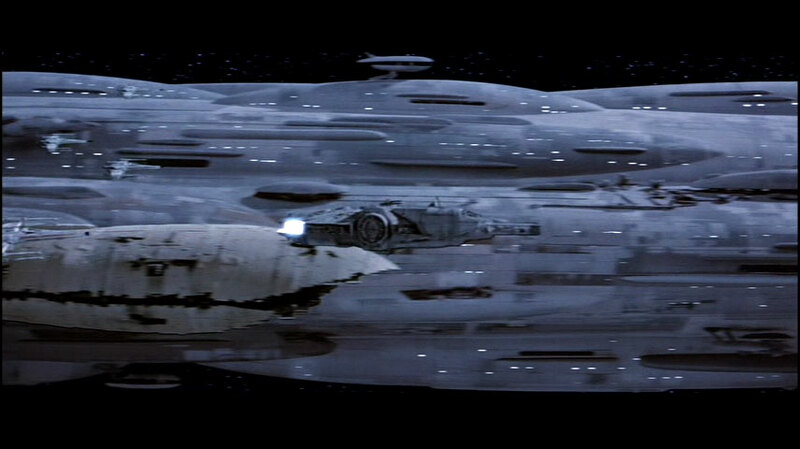 A photomosaic of the vessel's entire length, built out of multiple frames from the film sequence, Reveals the dimensions of Ackbar's flagship strikingly. Assuming that the corvette is much closer to the cruiser than to the camera, Home One is not less than 3.15km long and the visible portion is at least 0.32km deep. Note that these are approximate lower limits, depending on whether the perspective scaling of the corvette is the same or greater than for the cruiser. Sequence of frames from a zoom along the side of Home One, moving parallel to the ship's axis. 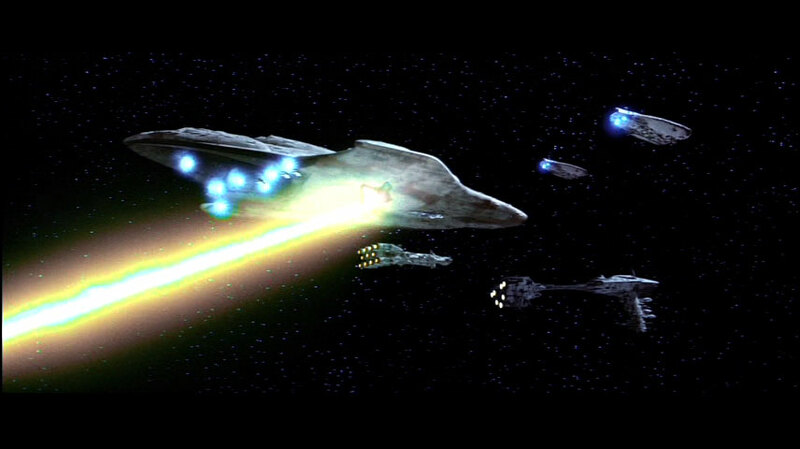 Several known images show Calamarian cruisers of the Liberty type or its wingless counterparts engaging in point-blank contests with Imperial star destroyers. Although none of these illustrations have yet shown definite scaling cues, the cruisers do appear to be smaller than the Imperial ships in terms of length, depth and breadth. The commonly-published length of 1.2km may be realistic for the Liberty and [anonymous wingless] cruiser classes. Liberty-type cruiser (far right) in close proximity to a one-mile Imperator-class star destroyer appears to have approximately the 1.2km length which is widely published. Many of the proportions of the Liberty-class cruisers can be directly measured from direct dorsal and starboard photographs. The ratio of the wingspan to the ship's length is approximately 156 to 400. In the same scale, the width of a particular bulb on the port wing is 8. 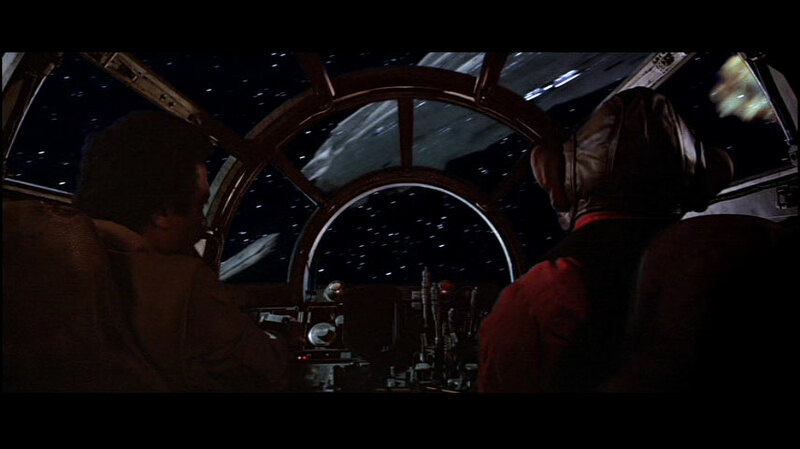 At one point during the Battle of Endor, there was a starfighter chase over the wing of a cruiser of Liberty's type. A Y-wing fighter flew very close over the bulb measured above, and when it was in this position its width compared to the bulb in a ratio of about 15 to 39. The fighter was not exactly on the cruiser's surface, (it is therefore closer to the viewer) so these estimates will only be lower limits. Therefore in relation to the Y-wing's width, the cruiser's length is approximately 130±16; and the wingspan is approximately 51±6. These figures can be combined with the known absolute width of the Y-wing to estimate the cruiser's absolute dimensions. Judging by the scale of the set plans of the Y-wing cockpit in The Art of STAR WARS Episode VI: Return of the Jedi and the blueprints of the whole ship in Rebel Alliance Sourcebook , the width of a Y-wing is about 7.88m. The length is about 14.3m according to the same method. 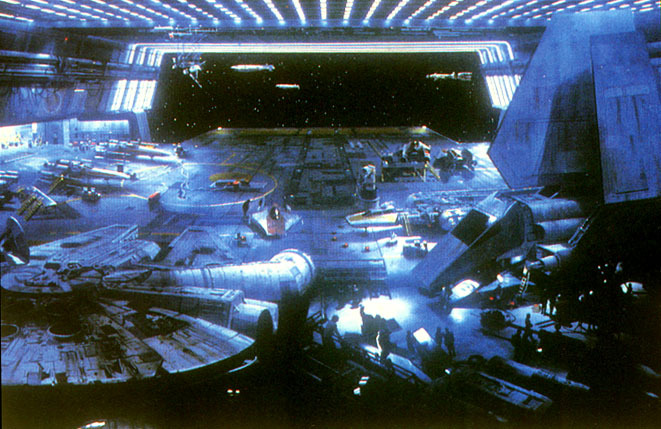 (Note that physical sets in STAR WARS have often been built to a slightly smaller scale than the authentic scale of the models. The intended scale of the A New Hope Y-Wing model suggests length and width of 17.04m and 9.12m respectively. Other unverified sources hint that the Y-wing should be 16m long.) Therefore the Liberty is greater than 1.0±0.1km long and greater than 0.40±0.05km wide. 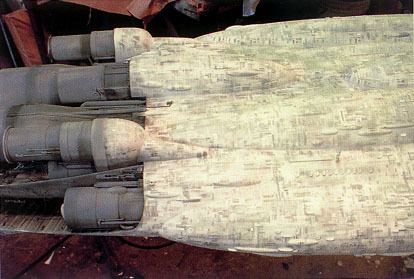 Dorsal image of the Liberty model and the Y-wing flyover scene used to determine an approximate length for this cruiser design. In the dorsal image, the starboard side is tilted away from the viewer by a few degrees, but this is so sufficiently slight for the above measurements to still be feasible. 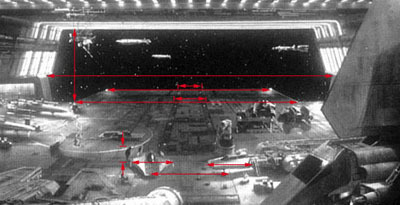 Analysis of imagery from Return of the Jedi indicates that Home One is approximately 3.8km long. Indirect measurements using the starboard hangar agree with the more precise calculation based on the Corellian corvette as a yardstick. The size of the regular Calamarian cruisers is not so well determined by the present evidence. 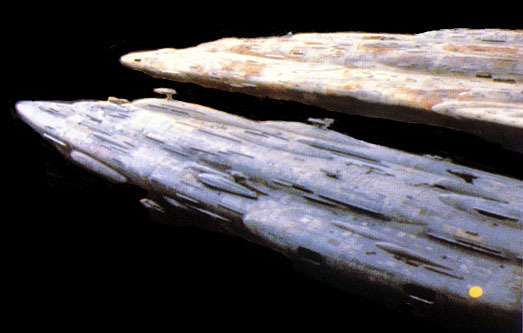 It is likely that the Liberty and the white wingless cruiser type seen at Endor are the same length, since the designs have many features in common which are likely to be sensitive to scale. Photographs of the cruisers in point-blank engagements with Imperial destroyers hint that the Calamarian ships are less massive and are slightly shorter than a mile. Consideration of the scaling of the ILM effects models hint that the length may be approximately 1.5km. The figure of 1.2km, which is commonly published in second-generation references, can not yet be ruled out for cruisers other than Home One. Given the famous customisation and variability of Calamarian warship designs, cruisers of 1.2km length have probably existed. 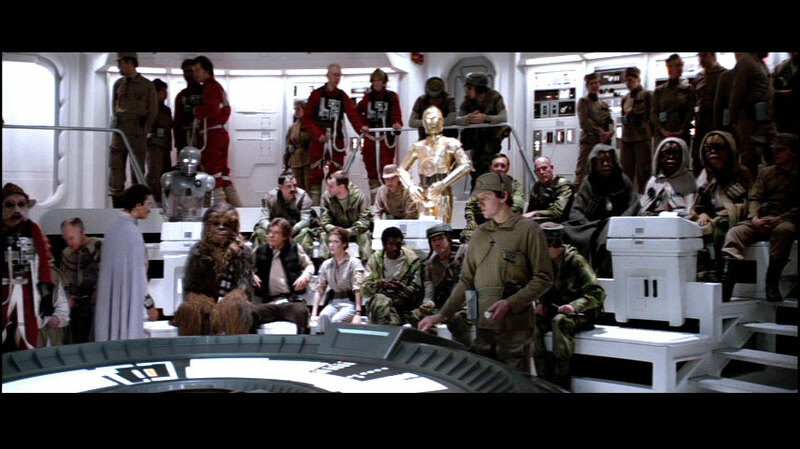 Proving that they were among the vessels at Endor is a separate matter. The published statistics for these vessels should not be assumed to apply to the entire Calamarian starfleet without variance. Galactic-standard starships possess at least three independent forms of propulsion which are applicable under different circumstances. The first mode is repulsorlift, which involves the generation of artificial antigravity repelling nearby objects. This is the most effective mode of propulsion for ships flying within several diameters of a planet. 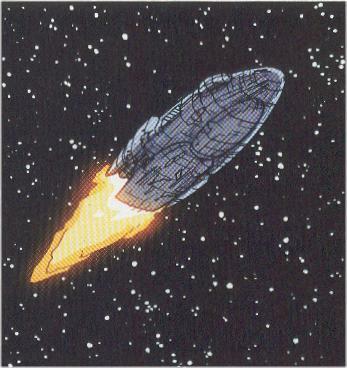 It is unknown whether the Mon Calamari employ repulsorlift technology, but at least some of their star cruiser designs are capable of safely landing on their homeworld, as seen during the evacuation of Calamari six years after the Emperor's betrayal and defeat at Endor. The form of propulsion which makes trans-galactic travel possible is hyperdrive. These mysterious but commonplace devices allow a vessel to circumvent the lightspeed barrier, entering an aspect of reality perceived as “hyperspace”. Matter in this state feels normal to itself, but is only able to travel faster than lightspeed relative to the rest of the galaxy. Typical average hyperdrive speeds may be on the order of a million times lightspeed. During the jump into or out of hyperspace, the starship is subjected to tremendous accelerations. It is uncertain whether this is merely a pseudomotion by-product of the jump process or a prerequisite of the jump. In any case, the violence of the acceleration requires excellently tuned inertial dampers to prevent crew and contents from being pulverised. 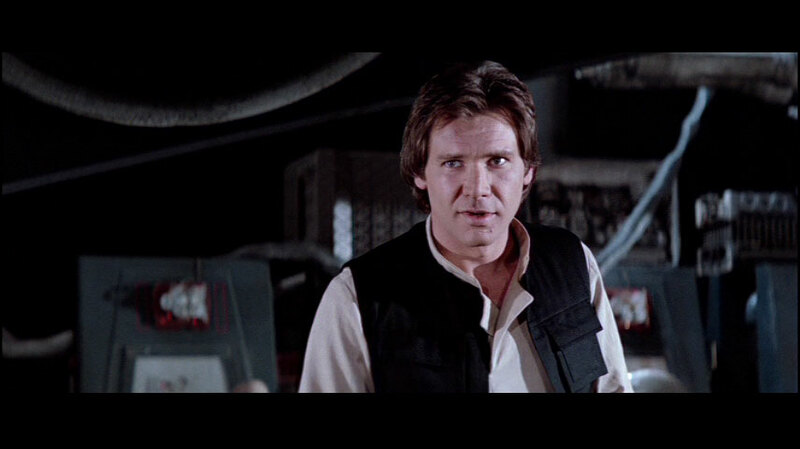 The Millennium Falcon, a small and highly-modified Corellian freighter, has sufficient imprecision in the connection between hyperdrive and inertial dampers that residual inertial forces may harm passengers who are not strapped to their seats. 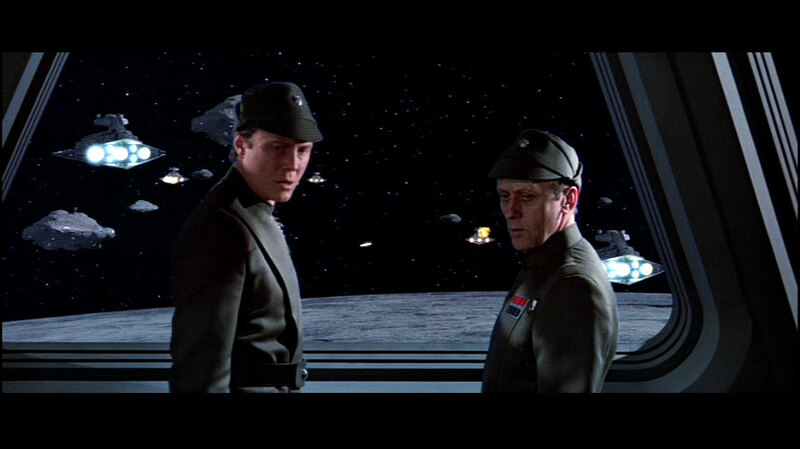 However the equivalent systems of Calamarian star cruisers are sufficiently well tuned and calibrated that bridge officers are able to walk and stand freely without fear of losing balance. Other systems of propulsion are employed for sublight movement in space away from the influence of planets. “Ion drives” and similar devices accelerate charged particles to relativistic velocities and eject them from nozzles at the rear of the ship. This expulsion imparts an equal and opposite forward thrust to the vessel. The direction of thrust can be controlled to some extent by vectoring the particle stream through electromagnetic baffles around the rim of the thruster. The nozzles also glow incandescently with a colour which characterises the temperature of the visible parts of the thruster's internal mechanisms. All known Calamarian ships have bright blue drive-glow, indicating very high temperatures. Unfortunately, complicating considerations of the thrusters' internal geometry make it difficult to speculate on whether the Calamarian drives' high temperatures indicate great inefficiency (energy wasted as heat) or else particularly high power output. The thruster nozzles of the sublight drives of all known Calamarian star cruisers are reminiscent of those mounted on many human-designed warships like the Executor and the Vengeance. The Calamarians were a species who had only recently begun interstellar exploration. Their vessels were refitted with more modern technology learned during servitude to the Empire and given in aid by the Rebel Alliance. The extent of this technological upgrading is not known, but it is possible that the thrusters were inspired or manufactured since contact with humans. They may even be stolen Imperial technology replacing the more primitive propulsion systems of the original Calamarian designs. Although Calamarian cruisers exhibit many asymmetries on the smaller scales of knobs and blisters on the main hull, the propulsion systems are distinctively balanced. Stern structures are always bilaterally symmetric, with engines placed either on the midline or else balanced in port/starboard pairs. This ensures that there is no port-starboard torque on the vessel when engine output is kept even. 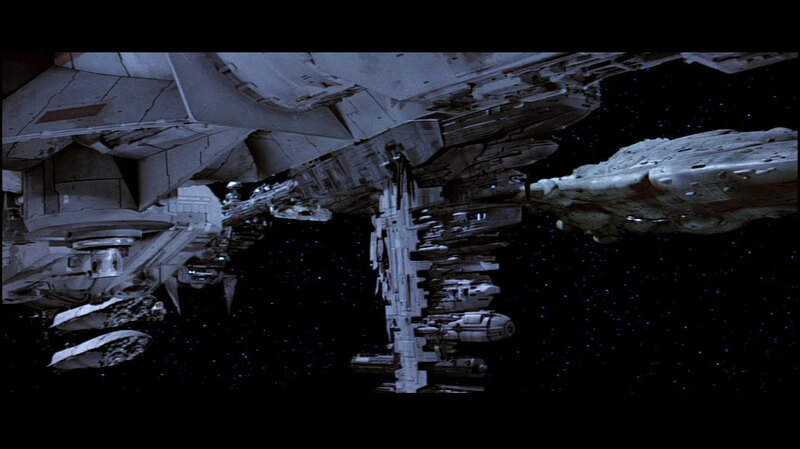 There does however seem to be an excess of thruster area on the underside of each ship. If this is not actually counterbalanced by the ship's weight distribution or careful moderation of some of the engines' output, then the vessel will tend to turn in a vertical plane. The Calamarian warships observed at Endor could be classified solely according to their engine structures. Home One has a rounded, bulbous stern, and the ten thruster cylinders protrude boldly from the sides of the ship. Nozzles are placed at greatly varying distances from stern, rather than together in a single bank. The engines are positioned far from the ship's axis, so that when viewed from behind, the nozzles are arranged in a ring around the hull outline. This concentration of propulsive power at extremities may optimise turning ability as compared to the ship's basic linear acceleration. On the [anonymous wingless] and Liberty designs the engines cover almost the entire stern profile, as a single clustered thruster bank. The bank is sheltered inside a cavity. The engine cylinders of these classes of ships vary less in diameter than those of Home One. Liberty has dorsal and ventral fantails, and only nine thruster nozzles. On the wingless cruisers the configuration is the same except that the ventral fantail is replaced by an additional thruster cylinder on the keel line. The crossectional area of a cruiser's engines presumably is related to the maximum total sublight thrust the ship can achieve. Since Liberty has slightly less thrust area and somewhat greater tonnage than its wingless counterparts, it probably has poorer accelerative and turning capabilities. The thrust area of Home One is much smaller in comparison to the vessel's mass than for Liberty and the [anonymous wingless] ships. Thus the flagship may be much weaker at linear acceleration. On the other hand, Home One's concentration of thrusters at its extremities may be beneficial for turning. Viewed in contrast to each other, the characteristics of the three designs suggest that Home One has respectable manoeuvrability but has weaker straight-line acceleration; and the [anonymous wingless] cruisers have marginally better acceleration than Liberty. Rear view of Liberty, showing precise engine placement; from Behind the Magic . 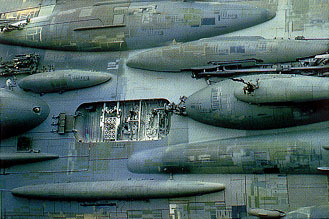 Seen immediately before the jump from Sullust to Endor, the engine configurations of Home One (lower left) and a Type-3 cruiser (lower right) can be seen clearly. The second image shows only the engines of Home One, but in greater resolution. The Liberty, viewed from below immediately before its destruction. The dorsal fantail is clearly visible; the shorter ventral fantail is dominated by the glare of the engines. Stern of an [anonymous wingless] star cruiser, at the lower right edge of the image. Alliance fleet arriving at Endor from hyperspace, then veering off to avoid collision with the security deflector shield. The foremost ship is Home One, as indicated by the presence of pods on the hull. 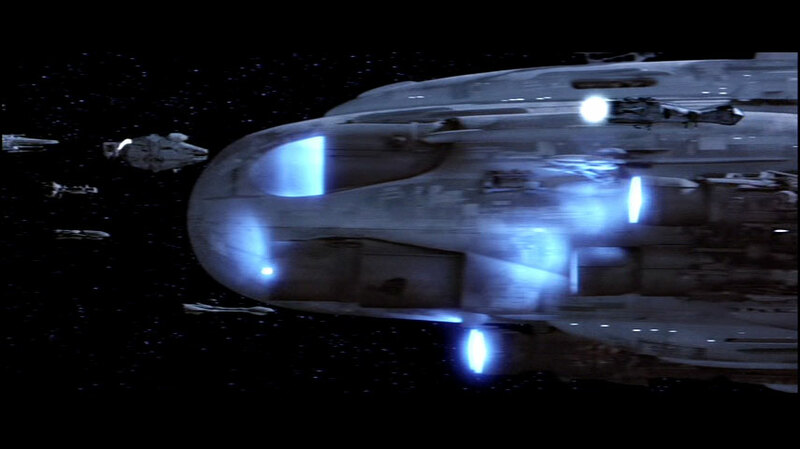 This ship demonstrates an ability to turn by an angle of at least ten degrees within a time of about two seconds after Ackbar's emergency order. Further in the background, a Liberty-type and an [anonymous wingless] cruiser are slower to respond. All of the Calamarian warship designs examined in photographic detail possess internal hangars for the reception of shuttles and other support vehicles, and to fulfil the mothership role for wings of rebel starfighters. On all three photographed designs the principal hangars are apertures on the flanks along the ship's midline. Liberty's hangars are near the bow. There are no hangars on the forward edges of the wings, although there are illuminated apertures outboard of the thrusters on the wings' trailing edges. The flanks and bow of the [anonymous wingless] type have not been imaged in sufficient clarity to determine the configuration of all the flank hangars. There is at least one confirmed bow hangar on the starboard side, resembling Liberty's. Home One has one hangar on the starboard side amidships, and two others (which may be marginally smaller) on portside. The hangar openings are hexagonal but they approximate the proportions of horizontally elongated rectangles. (In other words, the upper and lower edges are the longest, and the four corner angles on the long edges are each almost ninety degrees.) They are on the order of several dozen metres wide, which is much longer than the gunnery grooves, but they're not all the same size. The largest hangar on Home One has a ceiling high enough to comfortably contain a Lambda-class shuttle in its landing mode. The smallest hangars on Liberty's bow seem barely wide enough to accept a starfighter. The inner walls of the hangars are lined with smaller sub-hangars and work bays where starfighters and other vessels can be stored and serviced away from the central launch area. Bulkier spaceships like the freighter Millennium Falcon and shuttle Tydirium cannot fit into any of these bays, so they are parked towards the back of the main hangar space. The hangar apertures are sealed with atmospheric shields for the comfort of crew, and the edge of the field is marked by light strips. This is very similar to the conventional hangar signs which are standard to large human starships and space stations. The light strip is a cue to incoming pilots and a warning to personnel who might otherwise wander absent-mindedly through the atmospheric shield. It would be interesting to know whether this design was recommended by human technological advisers to the Mon Calamari, or whether the Mon Cals independently converged on this element of good safety and signalling. Ships of Liberty's class have what may be an additional pair of hangars in the wings. The cavity between the dorsal and ventral fantails (sheltering the thruster cylinders) extends laterally outwards, terminating in rounded holes in the trailing edges of the wings. However the propulsion systems are entirely confined to the part of the cavity which is in the main hull; the spaces in the wings must serve some other role. The hole in the port wing has been briefly seen; it is decorated with a linear arrangement of blue lights. These are reminiscent of the warning strips at the mouths of hangars. The holes, which are slightly more than 21m wide (according to Y-wing comparison scaling), may lead to special sheltered hangars. Hangars are points of vulnerability to a warship: poorly armoured and shielded holes which are also vital facilities for the ingress/egress of materiel, personnel and starfighter forces. Placement of hangars on the bow and flanks is non-ideal. Bow surfaces face dangers in the forward arc. The distribution of cannons on Calamarian cruisers favours broadside bombardment of enemy ships, but this inevitably exposes the flank hangars to return fire. A sensible choice for a combat starship is to place hangars on a dorsal, ventral or aft facing. The awkwardness of the bow and flank hangars is strong evidence that most known Calamarian vessels were not originally designed as warships. Only the ovoid ventral docking bay and the suspected Liberty wing hangars avoid being serious combat liabilities. Their more fortunate positioning may be coincidental, or they may be the result of modifications implemented after Calamari joined the Rebel Alliance. The roleplaying game statistics for the Mon Remonda, designated a MC80B design, exclude tractor beams. Since this vessel is has been more extensively modified for heavy combat than the average Calamarian cruiser, it seems reasonable to suppose that the statistics indicate a complete absence of hangars and docking bays. Vessels which lack these structures are less able to receive shuttles or freighters, and would typically receive their provisions and transfer personnel through extendable boarding tube connections. These kinds of devices are standard to human starships, and usually attach to another ship, a space station or a sufficiently tall mooring tower (like those seen on Byss in Dark Empire ). 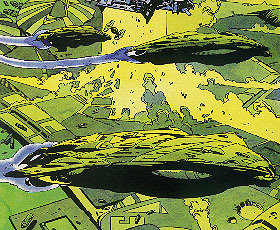 Calamarian cruisers might also be designed to land on the surface of a planetary ocean. The ventral cavity on an [anonymous wingless] Calamarian cruiser, which may serve as a docking bay. It has great internal structure, with varied lighting. The round solid body resembling ordinary hull within the bay is particularly interesting. 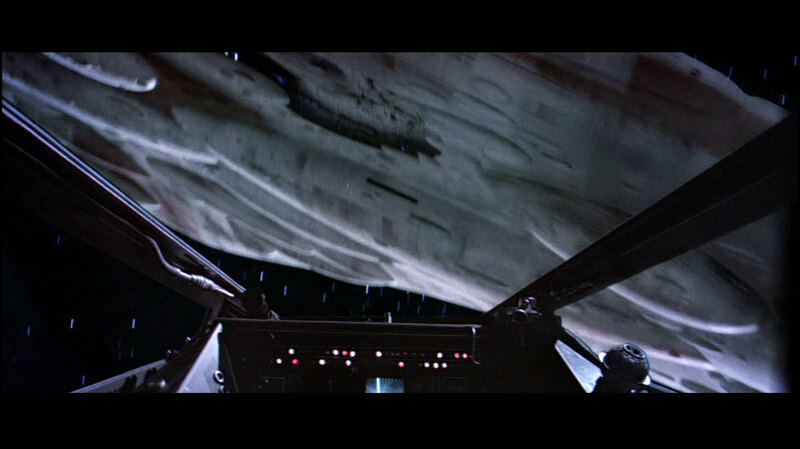 In the first three images we see the cavity before and during the collision of a TIE Interceptor. 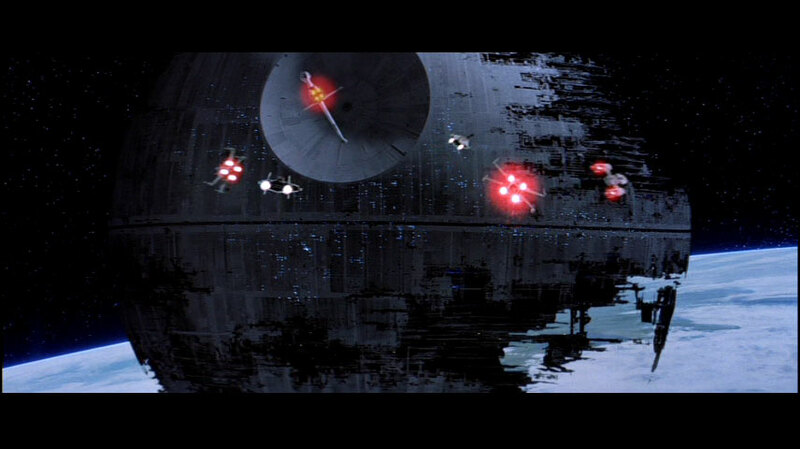 In the last image, the cavity is visible over the command tower of an Imperial warship of unknown type. The scanner globe on the Imperial ship is a good yardstick; at a diameter of about 40m it indicates that the cavity on the Calamarian cruiser is at least 60m wide and probably two or three times as long. A ventral view of a Liberty type cruiser as seen from an X-Wing cockpit. (The far side wing extends into the middle background. Several minor linear features may be small weaponry slots.) The ovoid ventral cavity is near top-centre, but for some unknown reason it is darkened and inert. Cockpit view from Millennium Falcon towards an [anonymous wingless] cruiser. 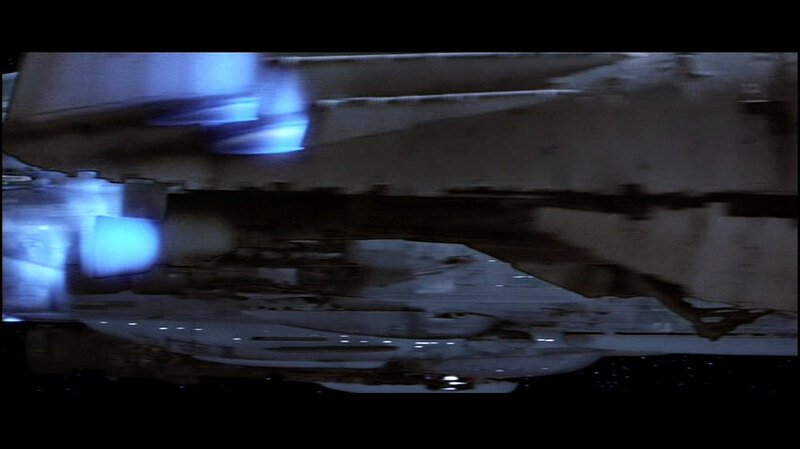 The illuminated area on the underside of the cruiser is the ventral ovoid cavity which resembles a large docking bay. Interior of the starboard hangar of Home One. A Lambda-class shuttle (22.25m tall) easily fits. Starfighters are mainly parked in the work bays off to the sides. Exterior views of the starboard hangar of Admiral Ackbar's flagship as the shuttle Tydirium launches. Storyboard sketch of the same event. Exterior image of the entire length of Home One, with the starboard hangar brightly lit. Sequence of three images of [anonymous wingless] cruiser at Sullust, in the background. One starboard bow hangar aperture is visible as a dark rectangular area. The illuminated ventral docking bay is also visible further back, though at this angle its projection is thin. B-Wings fly past in the foreground. The shape in the upper foreground is the underside of a Corellian corvette. This is what appears to be a rectangular ventral cavity on one of the cruiser designs, possibly Home One. Partially-symmetric layout of the surrounding bulges hints that the aperture is somewhere on the keel-line of the vessel. Trailing edge of the port wing of a Liberty-type cruiser exhibits what may be the entrance to a hangar. The hole is lit with rows of blue lights. The furthest outboard of the engines is on the margins of the ship's main body, not within the hole in the wing. The turbolaser batteries are mounted within grooves in the ship's hull. These grooves are elongated in the direction of the primary axis of the ship, parallel with the plane of the decks. Using the results from the study of the ships' dimensions above, the grooves appear to range from a dozen to several dozen metres long and never any less than two or three metres high. This identification allows for the estimation of lower and upper limits on the number of emplacements on any particular ship. We assume that there is at least one turbolaser or ion canon in each slot. Home One shows at least fourteen gun slots in the starboard view from From STAR WARS to Indiana Jones ; roughly one third of the hull is visible, so the total armament may be roughly three times greater. This result is reasonable compared to the statistics of 29 turbolasers plus 36 ion cannons stated in A Guide to the STAR WARS Universe . Similar dorsal views of Liberty show at least 7 + 9 grooves; the number of guns on the upper surfaces of this ship is no less than sixteen. Better inspection of imagery of the various cruisers will allow future armament estimates to be refined upwardly. The shape of the grooves hints that the guns may have very restricted arcs of fire. They should be able to swivel from forward to aft very easily, but up/down movement must be more limited. For this reason, Calamarian captains will probably take pains to orient their ships so that enemy vessels fall to either side and in the primary (deck) plane. 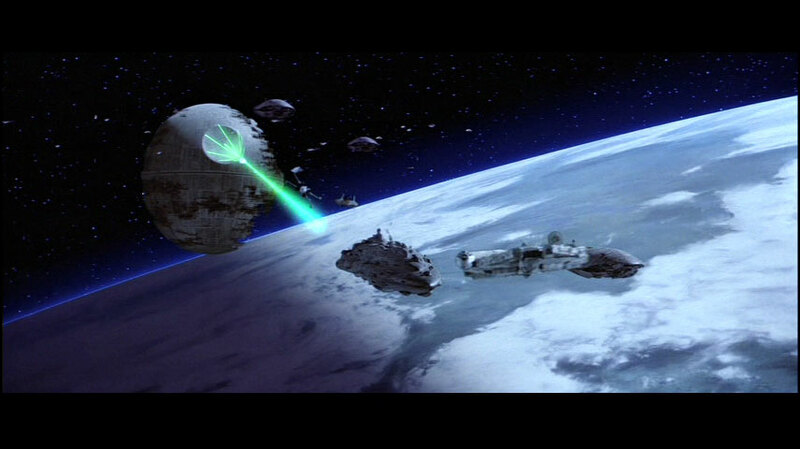 In the late moments of the Battle of Endor the rebel fleet hovered at low altitude above the surface of the Death Star II, bombarding the unprotected surface. Their observed orientation during this stage of the battle implies that they have at least some heavy weapons mounted on ventral surfaces and capable of being directed downwards. Perhaps there are ventral missile tubes or other armaments suitable for use against well-armoured immobile or slow-moving targets. This storyboard sketch reveals that the turbolaser batteries are located within the longitudinal grooves on the warship's flanks. This is a ventral view of a Liberty type cruiser as seen from an X-Wing cockpit. (The far side wing extends into the middle background. The ovoid ventral docking cavity is near top-centre, but it is darkened.) Several minor linear features may be small weaponry slots. Starboard view of Home One. At least 14 gun slots are visible. Several of the bulbs on the wing of a Liberty-type cruiser bear grooves and structures which look suspiciously like the barrels of heavy guns. 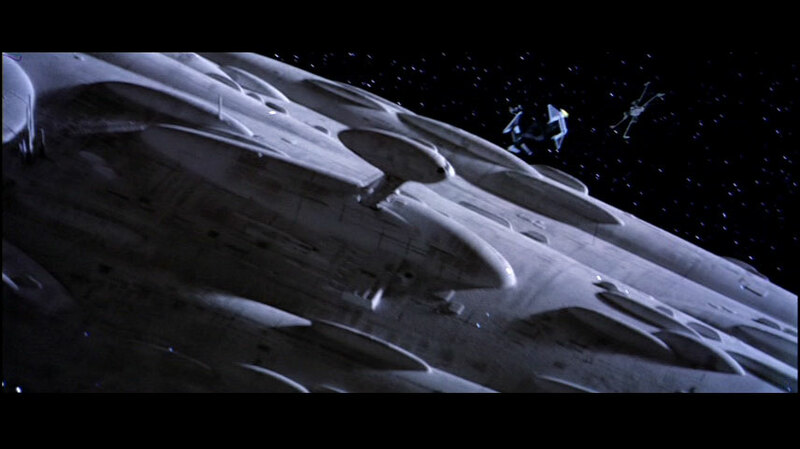 Calamarian cruisers oriented themselves parallel with the surface of the Death Star II during the minutes leading to the destruction of the Imperial command ship Executor and then the battle station itself. There is very little first-order evidence regarding the capabilities of the deflector and energy shields of Calamarian star cruisers. The best indirect limits are a comparison with independent lower limits on the firepower of Imperator-class star destroyers. 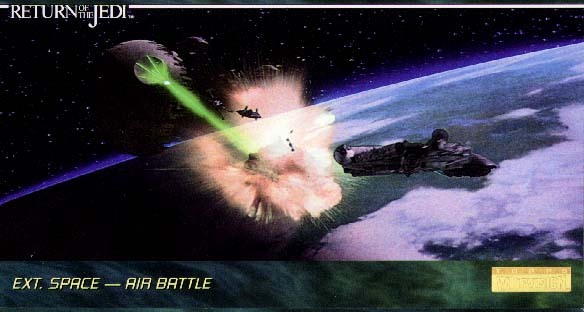 Calamarian cruisers at Endor managed to survive for at least half an hour in combat with the Imperial ships at point-blank range. Although they were battered and some were destroyed, the rebel ships must have had shielding which was at least on the same order of magnitude as their opponents'. 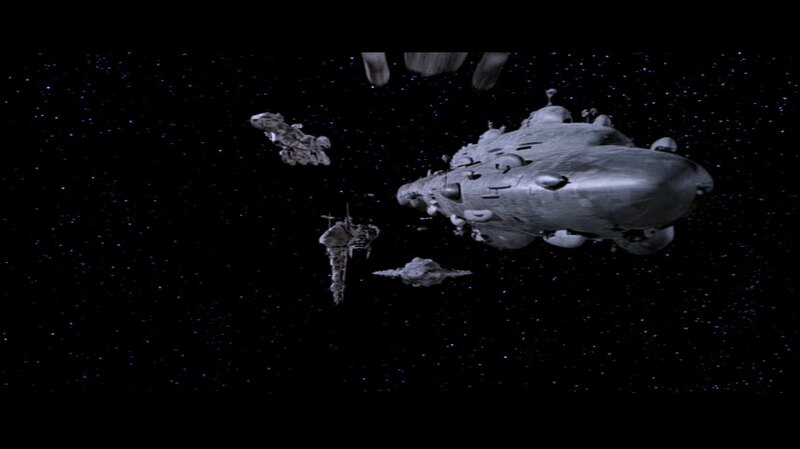 If they were very much weaker then the rebels would have been quickly eradicated; if they were very much stronger then the star destroyers would have been an irrelevance to the battle. The star destroyers each have numerous small anti-starfighter turbolasers each of which shoots energy bolts in excess of 32TJ at rates of up to one per few seconds. The sixty-four heavier cannons mounted to the sides of the dorsal superstructure are much stronger. The total destructive power deliverable by an Imperial star destroyer is no less than 10^24 Joules, estimated from the fact that these ships can melt the surface of a habitable world. 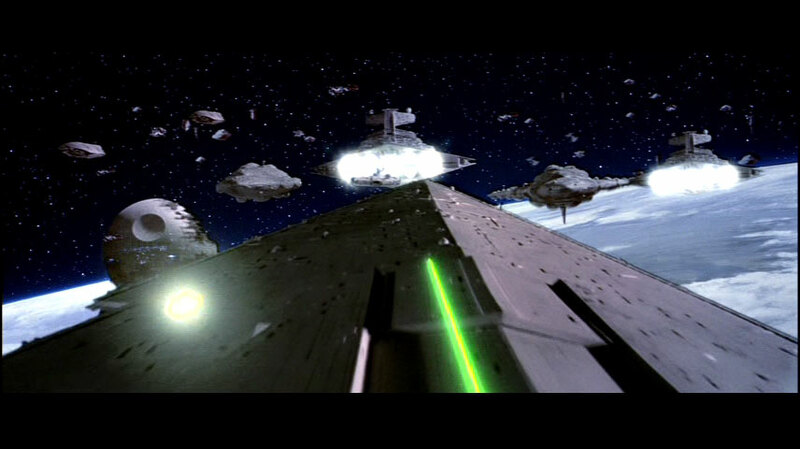 The star destroyer's total power is not less than some hundreds of millions of terawatts. Therefore the power dissipation rate of the Calamarians' energy shields must be on a comparable scale of power. 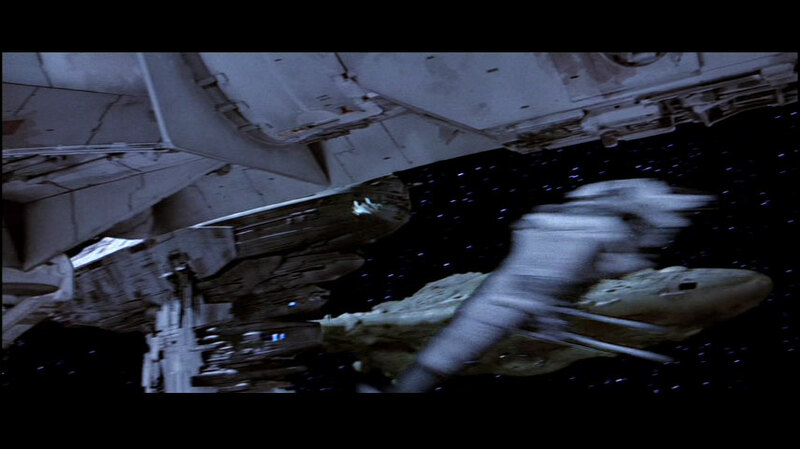 TIE Interceptor collides with the ventral cavity, which may be a docking bay. Artists' notes in Return of the Jedi Sketchbook state that at least one of the elevated “control pods” which sprout on dorsal fins actually contains the bridge. Among the warships seen on film, these objects only appear on the Home One design so they're all probably related to command and coordination functions. They could be command and auxiliary bridges, observation posts, or special sensor or communications towers. Six of the pods are mounted at various points near the centreline of Home One's dorsal surface. At least three more have ventral positions close to the port side. 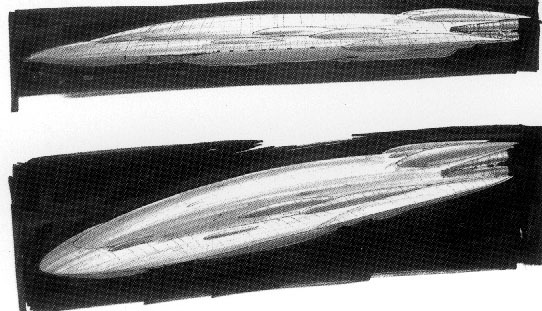 Other Calamarian warship designs such as the Defiance possess smaller numbers of control pods. The Liberty, Mon Remonda and a few anonymous designs lack the pods, but may possess similar structures that are flush with their hulls. 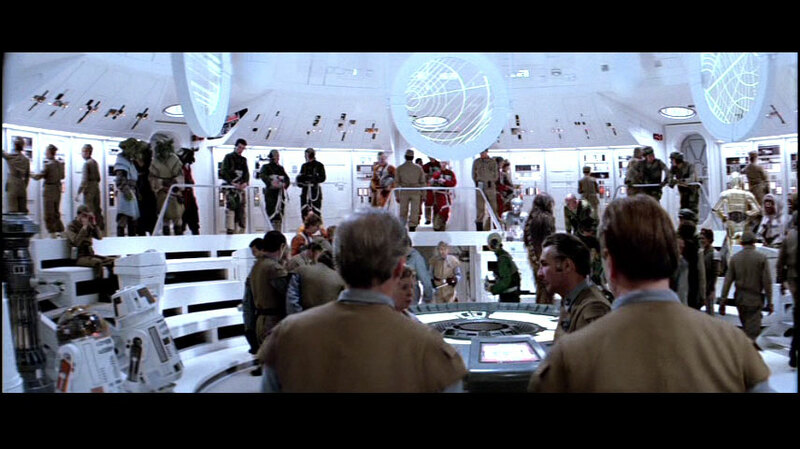 Apart from hangar glimpses, the main command bridge of Home One is the only interior chamber seen on film. The room is centred around a large amphitheatre where officers, crew and technicians study tactical holographic displays. 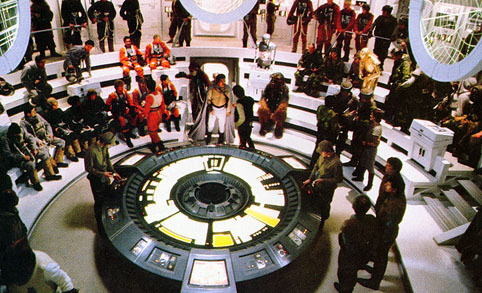 An operations deck encircles the pit, with control panels and system monitors. Several transparent circular tactical displays hang from the ceiling above the edge of the forum area. At the forward end of the bridge there is a roughly semicircular alcove dominated by three huge curved viewports through which the commanding officer surveys the surroundings. Three control chairs and consoles are mounted in this section. 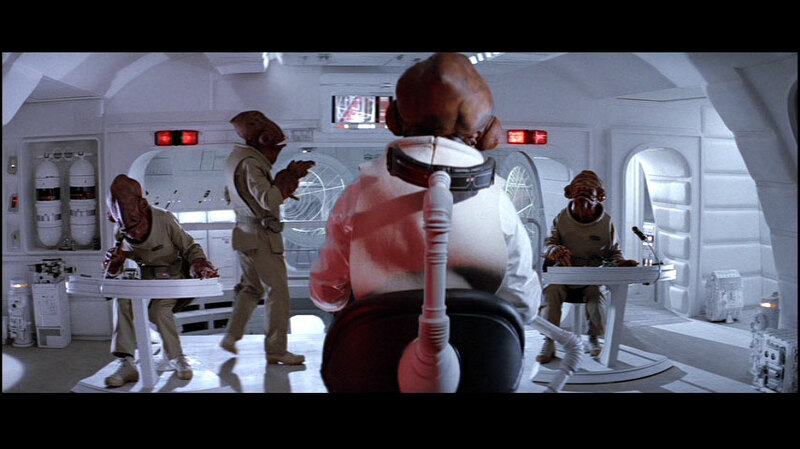 Admiral Ackbar sits in the foremost of these seats, directly in front of the observation windows. His chair and the attached console are mounted on a motorised armature which carries him around the area. In addition to the two other seated Calamarians, two stand at the back of the observation deck, operating overhead control panels. All command and crew stations are occupied by Calamarians. It is not surprising that members of this rebel faction should assume the most prominent positions aboard their own vessels, but there are more pragmatic anatomical concerns involved. Monitors and readouts designed for their species' eye placement may be uncomfortable or inconvenient for humans to read. The keyboards and controls are suited to the Calamarians' greater number of fingers and different manual dexterity. 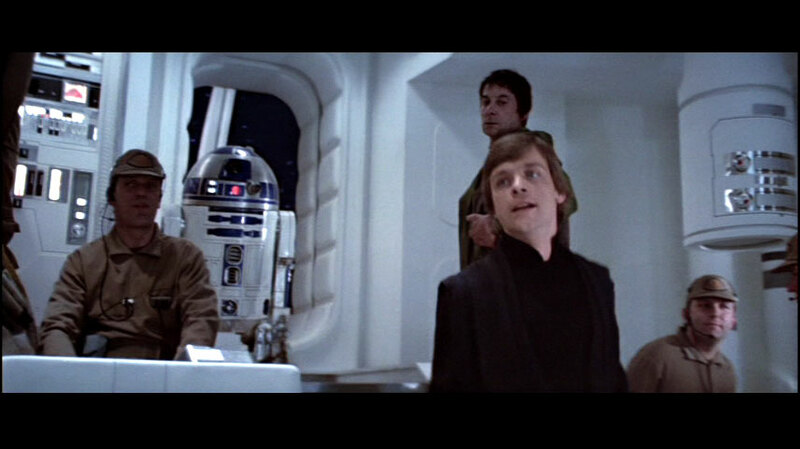 At the Sullust briefing when Luke Skywalker entered the main tactical auditorium, a doorway was visible behind him leading to a perpendicular corridor. 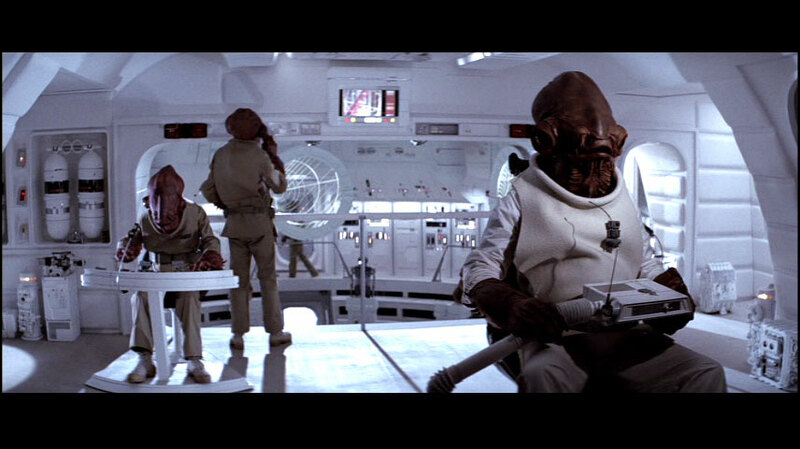 The far wall of that passage was dominated by viewports similar to those around Ackbar's command station. The fact that these sets of windows are in different directions but within a few dozen metres of each other means that the hull section enveloping the bridge and auditorium is narrow relative to the whole ship. The bridge of Home One has not been conclusively located on exterior views of the ship. The scenery visible through the viewports simply indicates that the bridge is in a dorsal location and faces forward. 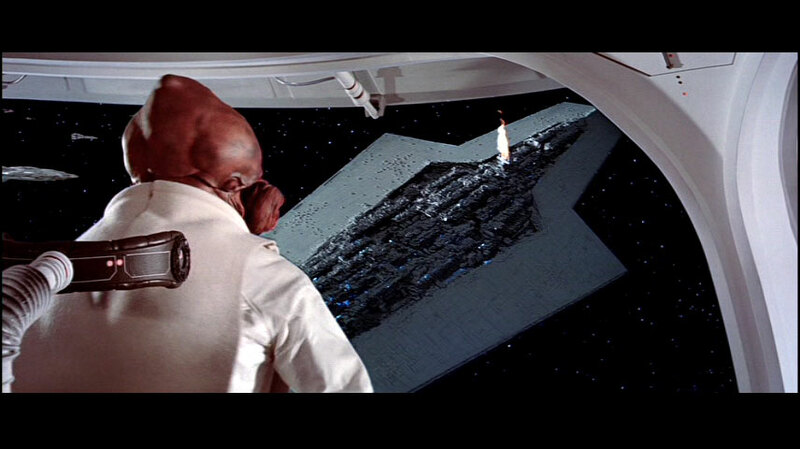 If other parts of the hull were visible through Ackbar's windows then we could place some more constraints, but only distant space is seen. Strictly speaking, the evidence of the films indicates that the bridge could be on almost any forward-facing surface of the bow or the lumps on the dorsal hull. 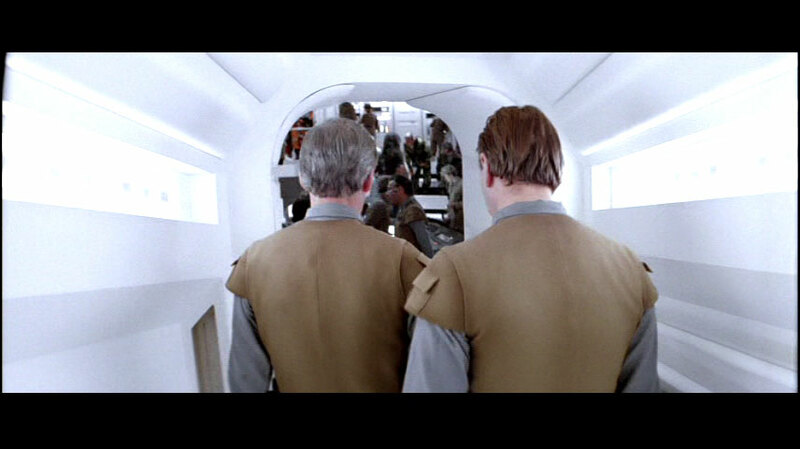 The existence of the corridor windows glimpsed behind Skywalker's shoulder proves that the bridge must be in either a narrow raised lump on the hull or (as suggested by the concept sketches) in one of the command pods. For the sake of fitting the auditorium and bridge corridors, the largest, topmost and most distinctive of the pods would be the most likely location. On the other hand a pod placed further forwards would be preferable in order to match the window views in which the ship's hull is unseen. The theatre region behind the command deck. 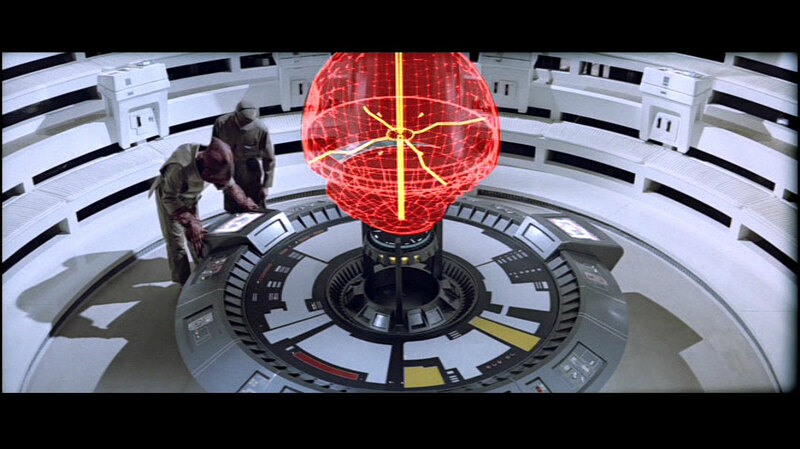 Technicians and tacticians monitor the battle's progress on a large holographic projector. On the command deck of the main bridge of Home One, Admiral Ackbar and two crewmen coordinate preparations for the attack against the Death Star II. 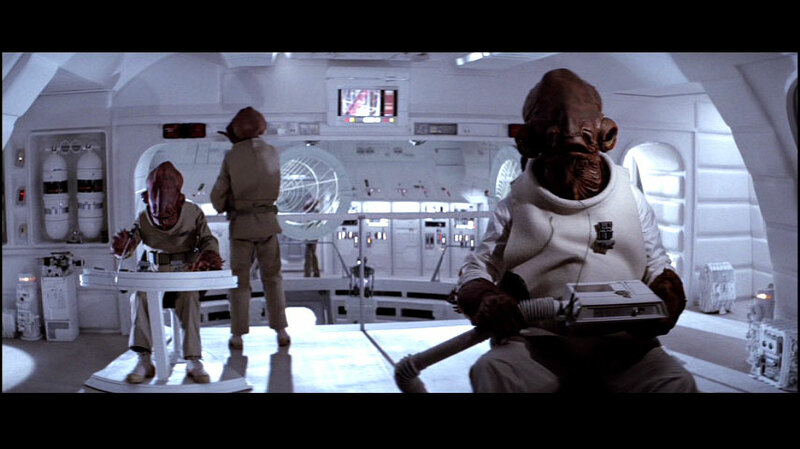 During the action at Endor, two standing controllers joined Ackbar and the other two seated calamarians. 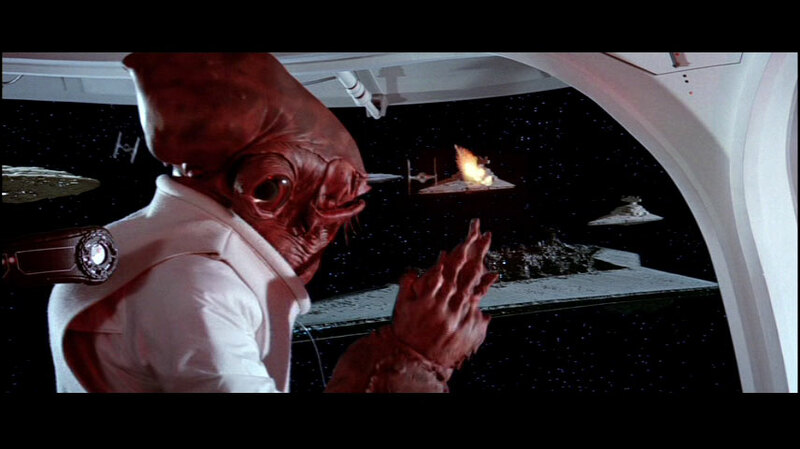 Admiral Ackbar directing the Alliance naval forces at the Battle of Endor. An arc of panoramic windows surround his command chair. Various views of doorways leading into the bridge chamber. 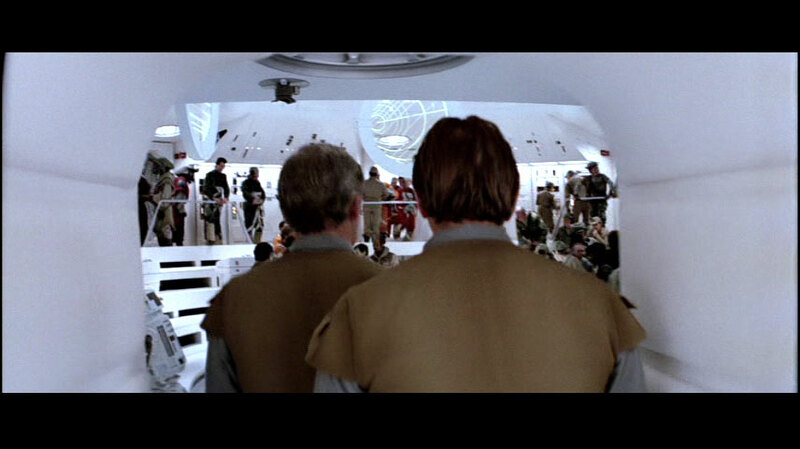 Viewed from inside the theatre, a viewport is visible beyond the door through which Skywalker entered. Close-up view of one of the dorsal pods which might contain a bridge. Judging by the surrounding hull features, this pod is the one which is semi-hidden in the portside long-range photograph described below. Long-range photographs of Home One. The first image is a portside view, showing five of the dorsal pods and three ventral pods. Another dorsal pod is barely visible amidships; it is not as obvious as the others since it appears below the horizon of the ship in this view. The second image is a starboard view; six dorsal pods are visible. Dorsal surfaces of Home One; the rest of the ship was obstructed in the original photograph. Several of the dorsal pods are visible. Very few of the Calamarian warships at the Battle of Endor have actually been named in present publications. The best that can be achieved towards the goal of listing the ships is to deduce minimum limits on the abundance of the three filmed designs, Where possible, the fates of the various ships can be stated. 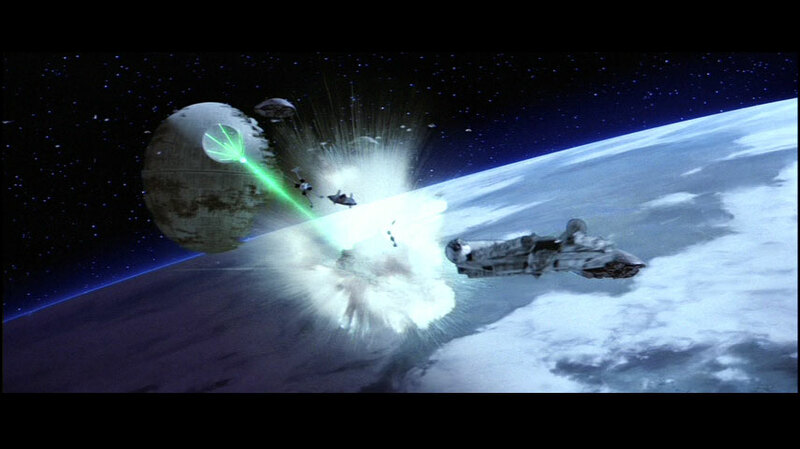 low-altitude bombardment of Death Star II after shield demolition, and starfighter attack on Executor. During the second phase there were at least four of the [anonymous wingless] cruisers. The Liberty was the first cruiser destroyed, but it was survived by another vessel of the same design. Home One survived the entire battle, but the second cruiser seen destroyed by the superlaser might have been either a sibling of Home One or another one of the [anonymous wingless] type. 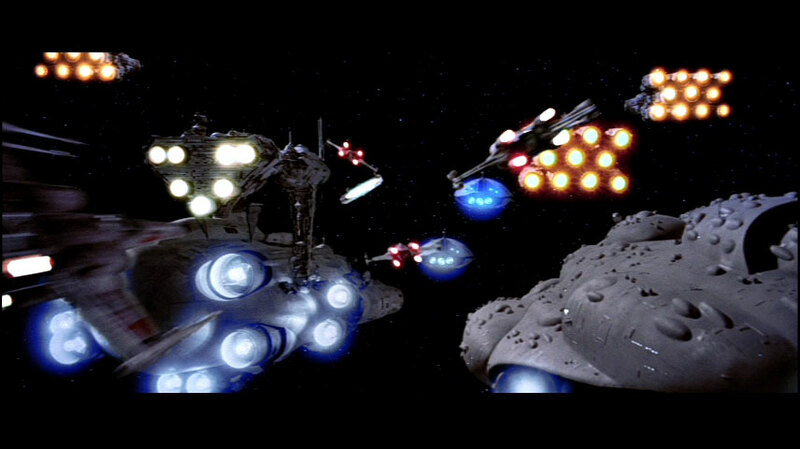 Rebel capital ships, escorts and starfighters at Endor, trapped between a deflector shield and an Imperial starfleet. Four wingless Calamarian cruisers are visible. The closest one of them matches the design of Home One. The three distant cruisers are mutually identical and are most likely to belong to the [anonymous wingless] class. 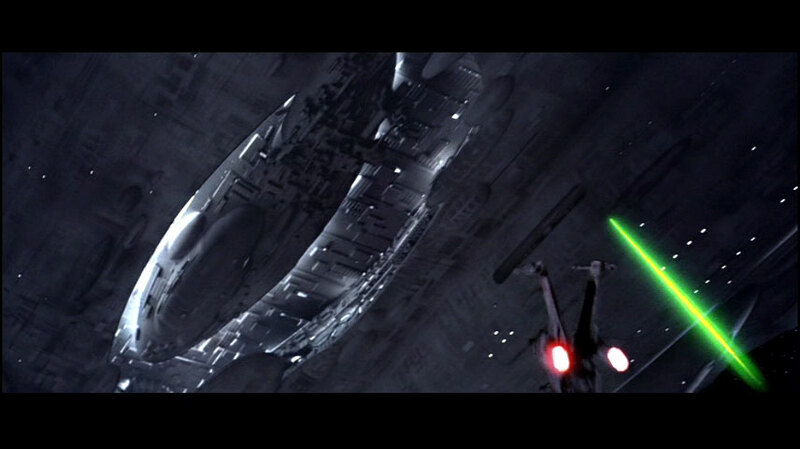 Liberty, exemplar of the winged design, was the first rebel ship struck by the Death Star II prime weapon. One of the Calamarian cruisers obliterated later was of a wingless type. It seems most likely to be of the [anonymous wingless] design, but these images are ambiguous enough that it might be akin to Home One instead. 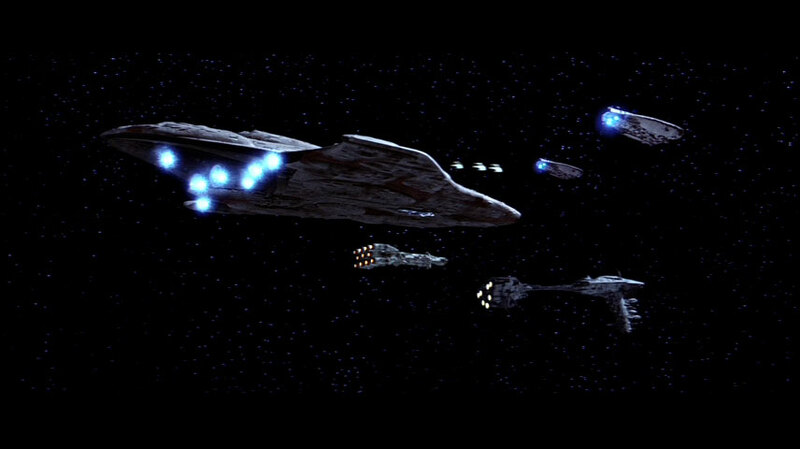 This image, taken prior to Ackbar's order to engage the Imperial fleet at point-blank range, shows four of the [anonymous wingless] cruisers in the background. At least one of the Liberty-type cruisers has survived into the third phase of the battle. There were also signs of the persistence of at least one of the [anonymous wingless] cruisers. Home One survived. In far-right background a Liberty-type Calamarian cruiser engages an Imperial destroyer. 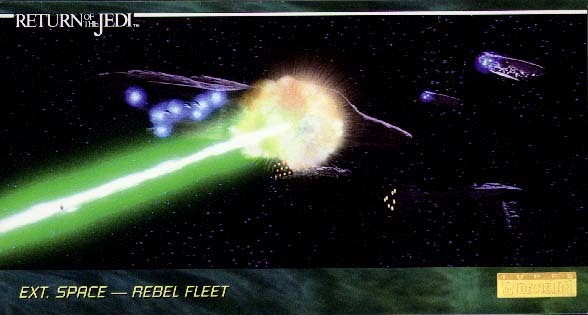 This image was taken after the fleets had closed to point-blank range, a rebel tactic aimed at reducing the vulnerability to the Death Star II which the Liberty explosively demonstrated. This picture proves that Liberty was not unique. An inverted Imperial destroyer in foreground. A Liberty-type cruiser is between two destroyers on the right; the cruiser on the left side of the picture is either Home One or [anonymous wingless] design. 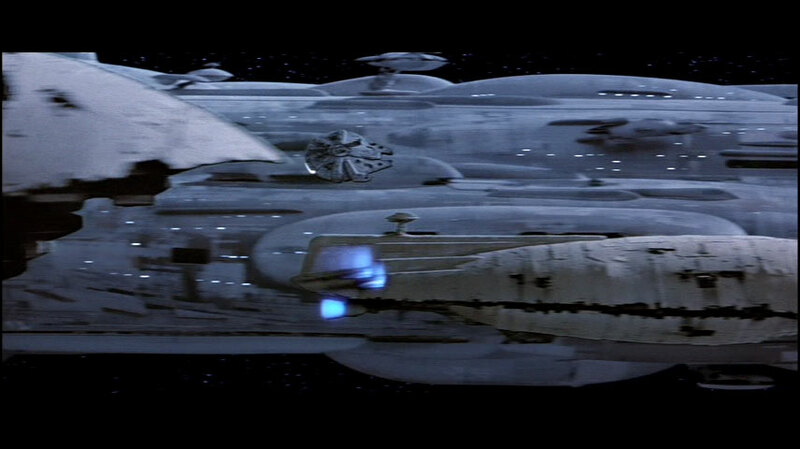 In the final phase of the battle at least two of the [anonymous wingless] cruisers were seen from the Executor bridge. They were nearby, and slightly to portside. Two other rebel ships of indeterminate type are beyond them in the background. At this moment, Home One was high above Executor's portside, at a distance which was on the order of 10km or more. 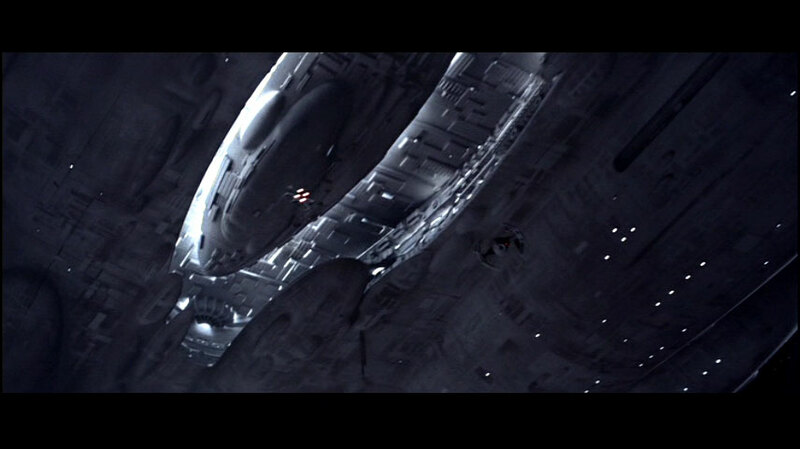 From the vantage of Home One, a possible fourth Calamarian cruiser of Liberty or [anonymous wingless] design is high above Executor's starboard flank. Wingless cruisers seen from bridge of Executor. At least the closest two appear to be [anonymous wingless] type cruisers. 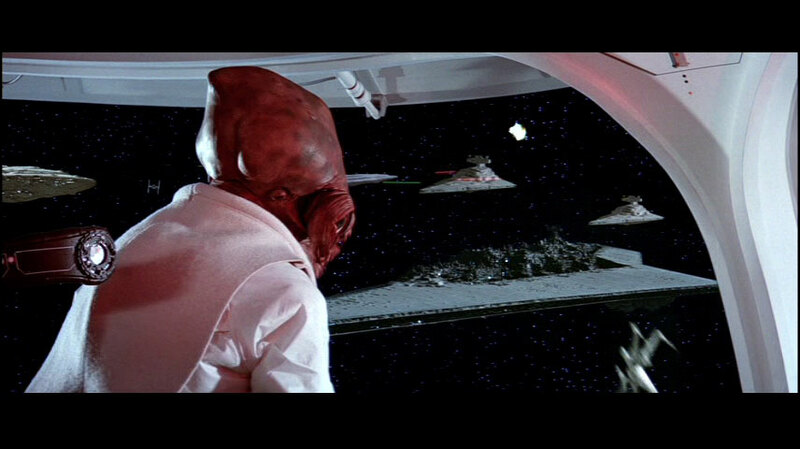 Five more Mon Calamari ships are in the background. Indeterminate ship in background off the starboard side of Executor's burning command tower. The rebel ship is either Liberty design or [anonymous wingless]. The shape of the stern makes looks more like that of a [wingless]. Executor dives to its doom, as seen first from space and then from the main command bridge of Home One. 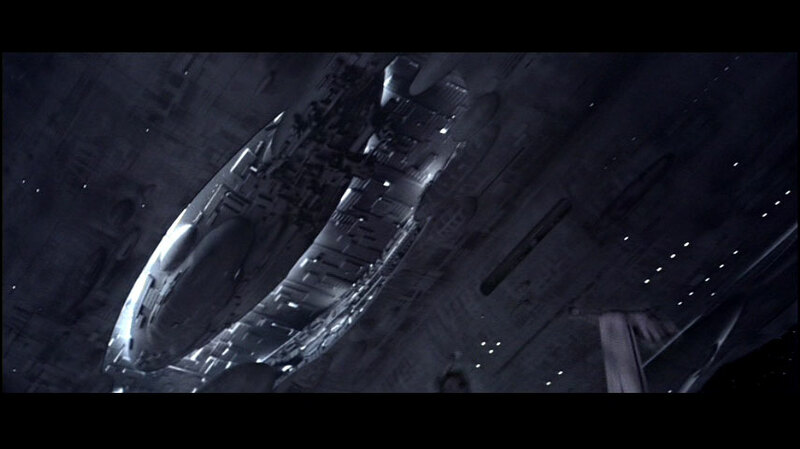 Both views appear to be on the same side of the Imperial flagship, the side Executor is turning towards as she plummets. In the space view there is a Liberty-type cruiser on the left and a vessel of Home One's class at the far right. This is important evidence that Home One was not unique. 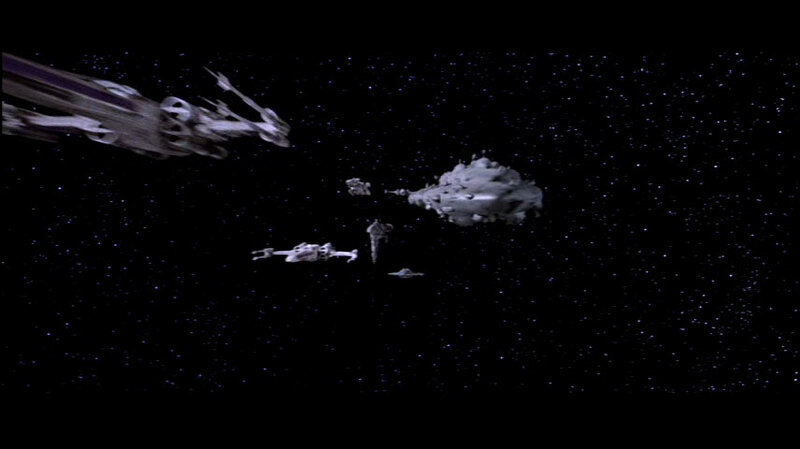 Numerous distant rebel craft of all kinds, fleeing the Death Star II explosion. This image is not clear enough to distinguish the Calamarian ships. 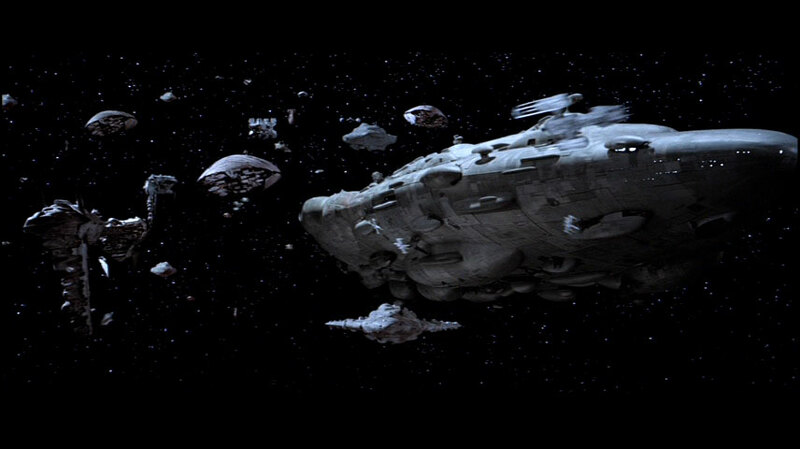 In summary, there was at least one cruiser of Home One type, another example may have survived past Executor's demise, and there may have been a third sibling disintegrated early by the Death Star II. There were at least two of the winged Liberty type, and at least one was destroyed. 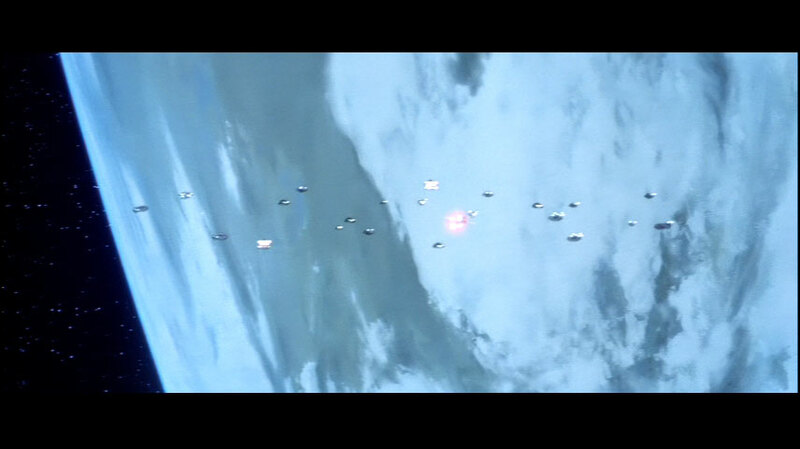 There were at least four of the [anonymous wingless] type, of which at least two survived the Battle of Endor. The names of Mon Calamari warships fall into several distinct types. In the computer games and Dark Empire comics, warships tend to be given girl names from European cultures (eg. Cathleen) or else names of belligerent virtues (eg. Independence, Liberty). 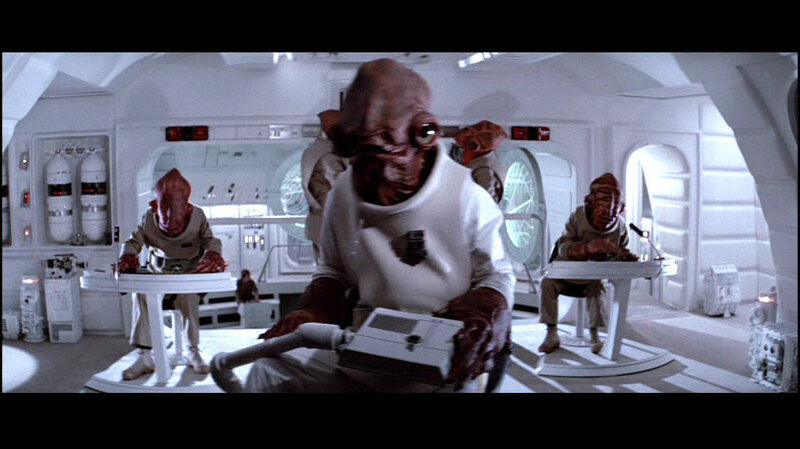 However the Mon Calamari ships in many of the novels are given names which appear to be Calamarian in origin: (eg. Mon Remonda, Naritus). 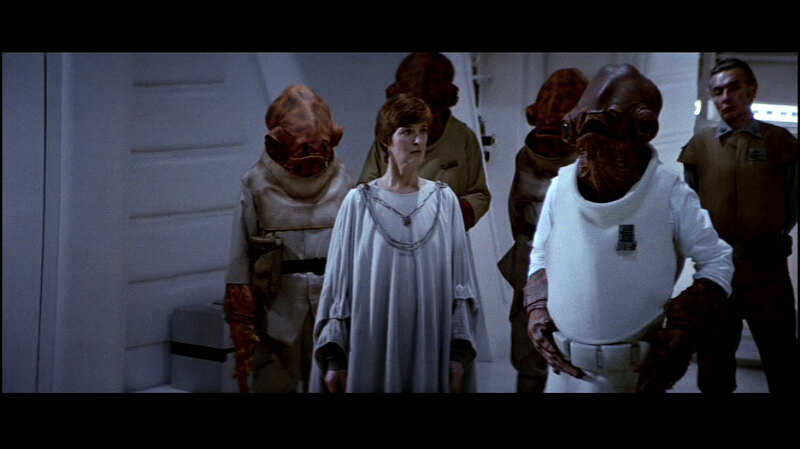 It may be that the Mon Calamari give their ships proper names, which may be difficult for humans to pronounce. In such cases, human rebels may grant nicknames or operational codenames to the Mon Cal vessels. Sister of Liberty, survived into at least the point-blank fleet combat at Endor. This may be the Maria. An [anonymous wingless] cruiser destroyed by superlaser. There is a slight possibility that it was a Home One clone instead. Unnamed wingless ship at Endor. Cruiser in X-Wing computer game, served as the Calamarian flagship at around the time of the Battle of Yavin. Possibly the same as Home One [speculative, unconfirmed]. 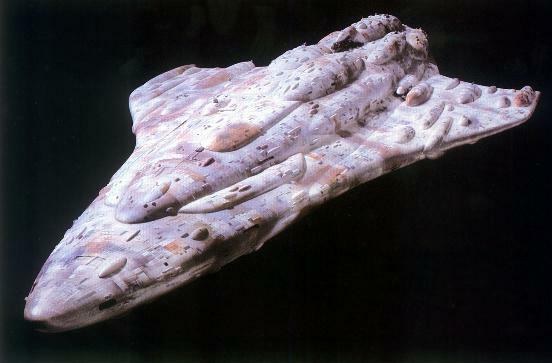 Possibly Ackbar's personal ship, distinct from Home One, as explained in The Truce at bakura . 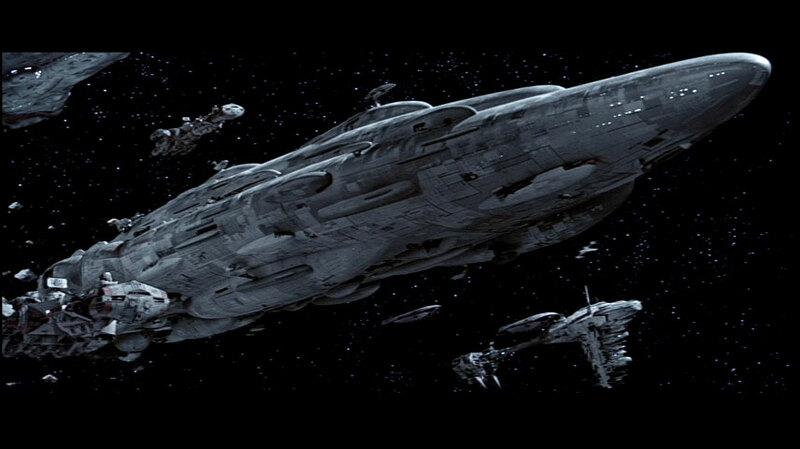 Admiral Ackbar's flagship during the events surrounding the Battle of Calamari. It was the first ship in built according to the MC90 design. Supposedly the second MC90 constructed, but its illustration [p.133 The Jedi Academy Sourcebook ] has little resemblance to Defiance. It is another cigar-shaped ship, but has a pointed stern rather than the MC90's blunt stern. This ship carried out reconnaissance missions to into the Deep Core in the year following the defeat of the mad clones of Palpatine. 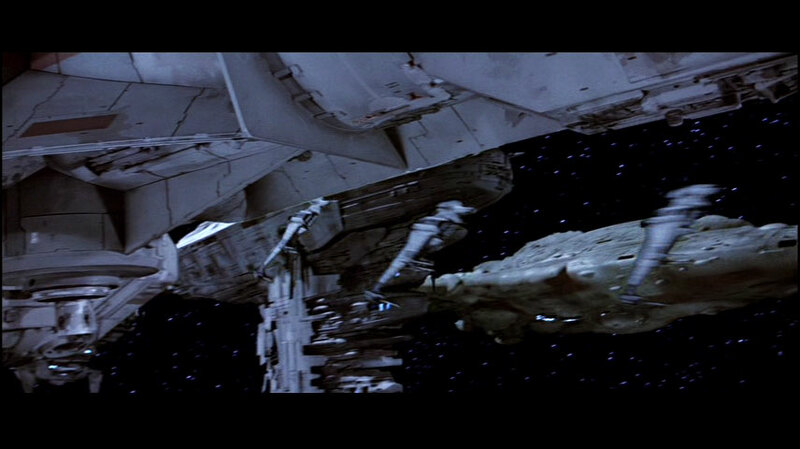 Flagship of Admiral Ackbar during the Battle of Endor. Over two miles long, and possibily the largest known Calamarian warship. 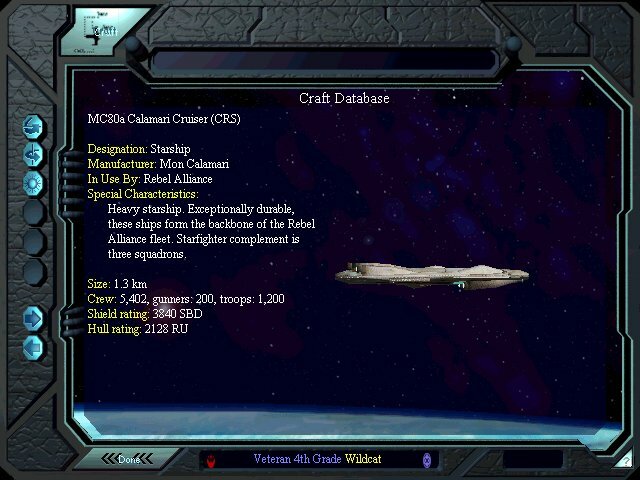 Ackbar's vessel at the Battle of Endor according to the X-Wing: Alliance computer game, but this presents a discontinuity because this Independence was very much smaller than the canonical Home One. This aspect of the game should be considered part of an “alternative universe” conflicting with the movies. Or perhaps Independence was Ackbar's personal ship, to which he reverted after the Battle of Endor, in The Truce at Bakura ? 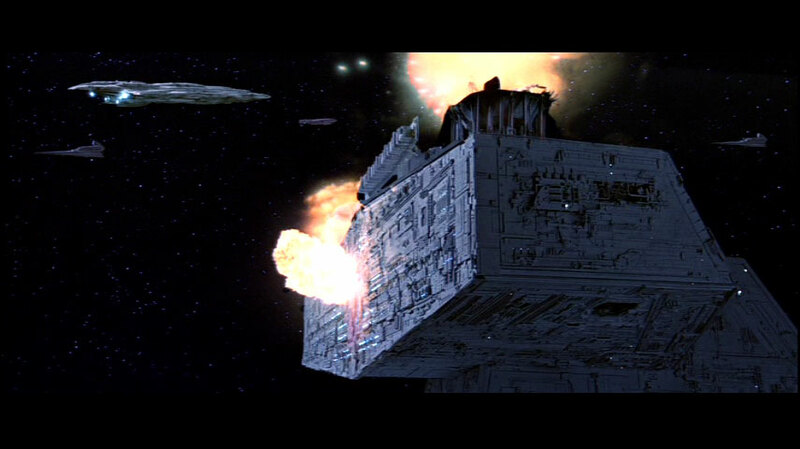 Winged cruiser which was the first Alliance warship destroyed by the Death Star II. ("CRS") A cruiser carrying Admiral Ackbar participating in a military summit in the Delfii system, shortly before the Battle of Endor [ TIE Fighter , Battle 12, Mission 6]. ("CRL") Rendez-voused with the renegade Admiral Harkov near the Parmic system at the beginning of Harkov's defection to the Alliance [ TIE Fighter , Battle 7, Mission 1]. 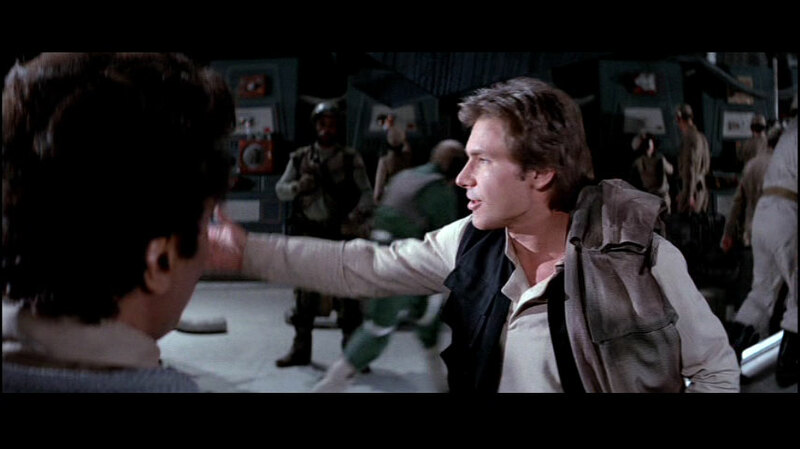 MC80B released 1.5 years post-Endor; participated in campaigns to capture Coruscant and eliminate Warlord Zsinj. Destroyed at Second Battle of Calamari by World Devastator Silencer-7. MC80a crusier used in the evacuation of worlds threatened by the Starbuster Plot in the Corellian sector fourteen years after the Battle of Endor. Captain Genkal commanding. Severed as a base for Rogue Squadron around the time of the evacuations. Flagship of a New Republic taskforce which lost an engagement in the Qat Chrystac system. After heavy losses the taskforce commander, Senator Bel Iblis, ordered a retreat, leaving the system in the hands of Grand Admiral Thrawn. Seems to be Liberty type. Severed as a base for Rogue Squadron around the time of the evacuations. Flagship of Rebel Alliance tactician Adar Tallon during the Battle of Heterkus, which was sometime between the Battles of Yavin and Endor. 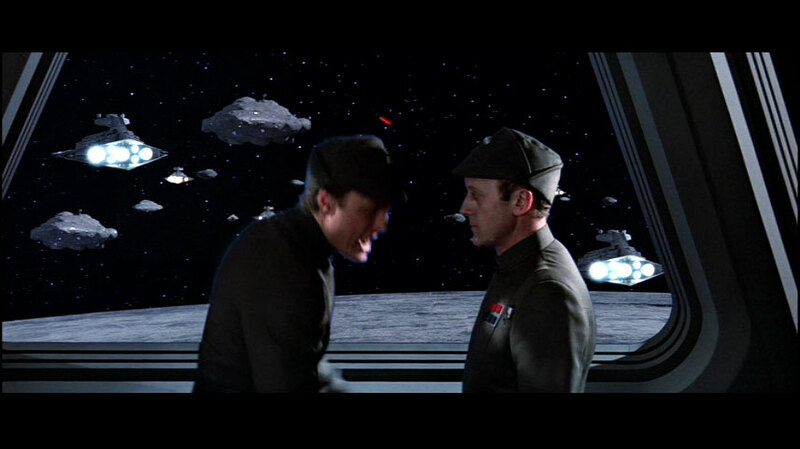 Tallon's fleet fought three Imperial star destroyers that were bombarding rebel facilities on the planet, along with civilian cities suspected of being sympathetic to the Alliance. 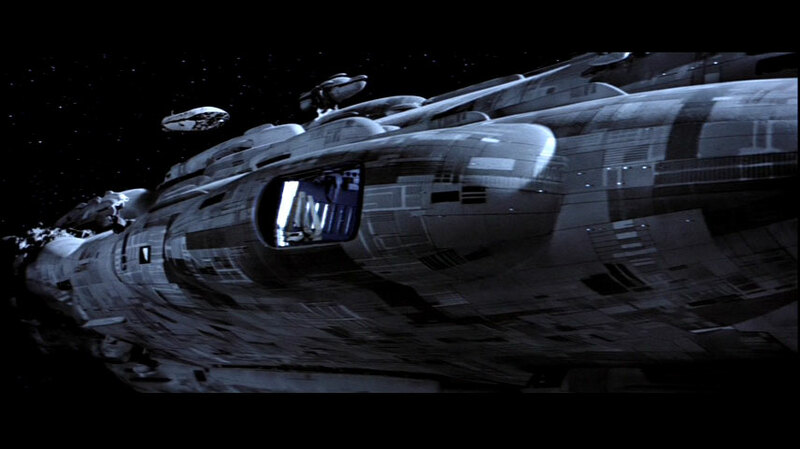 Since this vessel was active in the pre-Endor period, it is likely to belong to one of the classes seen at Endor. Partially-built ship of MC90 design destroyed during the attack on rogue Imperial Admiral Daala upon the Calamarian shipyards. A cruiser that sends out transports to take cargo from a container in an asteroid field in Bonus Historical Mission 1 of X-Wing Collector's CD-ROM . ("CRS") A companion of Lutdze at the summit at Delfii. 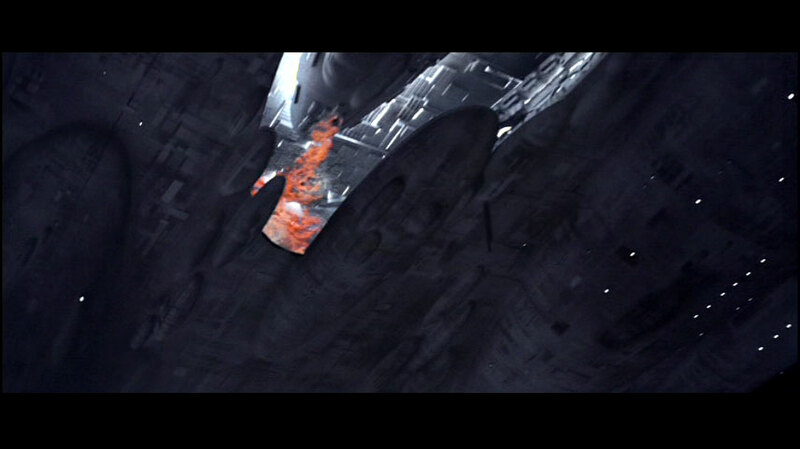 ("CRL") Destroyed in the Ottega system while attempting to aid the traitor Admiral Harkov's flagship, Victory-class Star Destroyer Protector. [ TIE Fighter , Battle 7, Missions 1, 2, and 3]. Calamarian cruiser of unknown design, captained by a Mon Calamarian named Commander Elpfel. Onetime flagship of General Wedge Antilles. Michael Baker for images of the MC40a, the 1300m cruiser, and for discussion of the mysteriously inconsistent MC80a designation in the computer games. Chris Boggs for suggesting the choice of the topmost control pod as the site of the Home One bridge; for alternative explanations for the TIE interceptor crash into the underside of a cruiser in ROTJ . 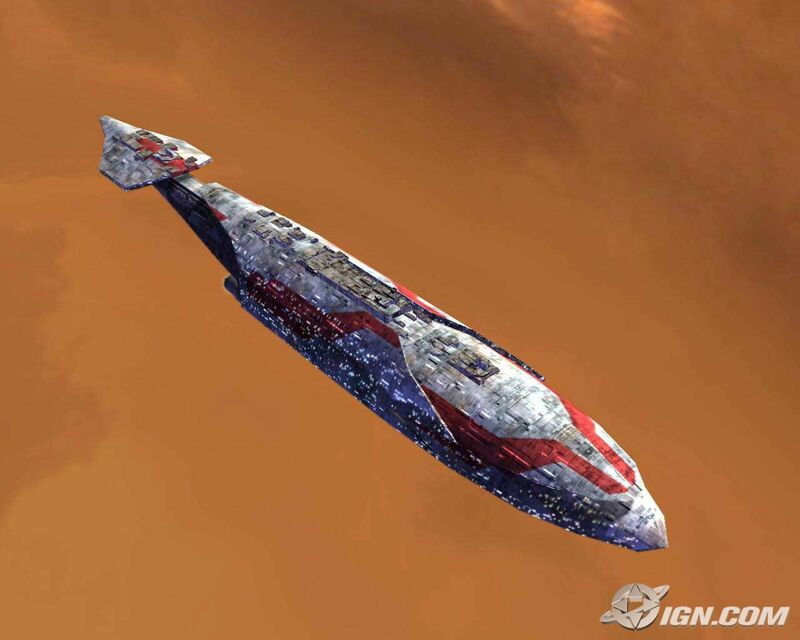 Tim Bradshaw invoked Ackbar's personal cruiser in The Truce at Bakura as an explanation of the apparent contradictions between Home One and Independence as identifications of his flagship in the movies vs computer game sources. Robert Brown for general and specific discussion; donation of numerous images; for a particularly clear digitised image of the stern of the pearly-hulled anonymous wingless cruiser. Persistent challenges regarding the tactical viability of Calamarian independence. Suggested using a Y-Wing as a yardstick. Pash Crackn for information about the MC40a; any game statistics for the MC80a (in X-Wing ). Jeff Erwin for greatly expanding my list of Calamarian warship names. Matthew Flegal for directing me to the superior Mon Remonda drawings and statistics in Essential Guide to Vehicles & Vessels . Kyle Forsthoff for screenshots and information about the “MC-80a” from X-Wing . 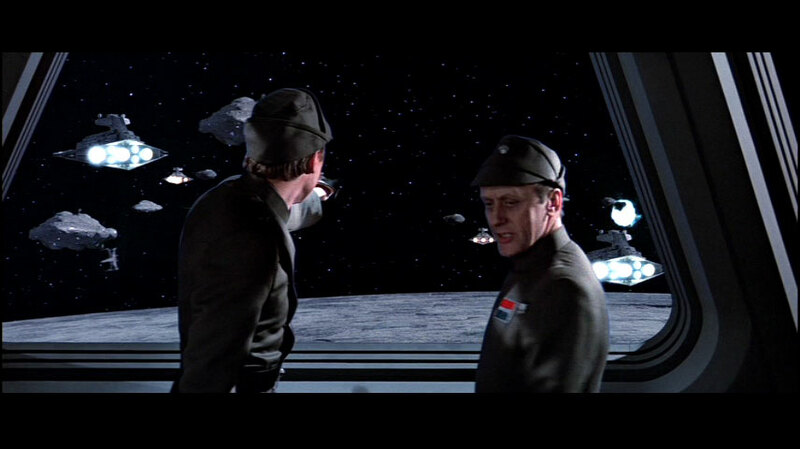 Justin Gann for noting the “battleship” reference to Home One in the Scrapbook ; for pointing out the possible attrition of Mon Calamari ships prior to the Battle of Endor. Frank Gerratana for general and specific discussion: images; number of ships. For the photomosaic of the full length of Admiral Ackbar's flagship. Martyn Griffiths for general and specific discussion: model scaling for Y-wings and the Calamarian cruisers. Ansel Hsiao contributed several items to the ship list. Iguana1700 for reminding me about the MC80a and raising one theory about the supposed non-uniformity of Calamarian ships. Espen Joergensen for first news of the WOTC webpage assigning 17km as the Viscount's length; and the implications for Mediator's length. For correction of the MC30c suffix. Makis Kalofolias for correcting my details about Orthavan. Dorian Kratsas for description and image of the MC30c. Andrew Larson for observing the similarity of the MC80a and the 1300m warship, suggestions about the identification of the MC80 with the ships in the movie, and general discussion about emphasis and terminology. Andrew Marshall for pointing out the discrepency in naming styles for Mon Calamari vessels, between the books and computer games; reference to Mon Karren and Mon Delindo. Forrest Mathews for remarking on the aesthetic similarity between [anonymous one-mile cruiser #2] and a Gallofree medium freighter. Charles McNeill suggested Home One's supposed 29 turbolasers may be a transposition of 92. Mark Miller for donation of initial images. William Obringer for Silent Water and the argument that “Home One” is a call-sign. Shay Pierce for the images of Mon Calamari ships from X-Wing: Alliance . Ethan Platten for the Balance of Power screenshots of the cigar-shaped cruiser. Reinier Steffens for pointing out the reuse of the cruiser name Defiance in X-Wing: Alliance . Max Steiner for his persuasive argument relating Home One's name to the naming conventions of Calamarian cities. Charbel Tengroth for descriptions of the Calamarian ships in the TIE Fighter computer game. Benjamin Thevathasan for identifying Reef Home. Anthony Tully for general and specific discussion: abundance of ships; designs; images. For the rare CINEFEX image. Justin S Tweet for the name of Stimsenj'kat. David West Reynolds for measuring the actual Home One model. Frank Wu for pointing out the reuse of the cruiser name Defiance in X-Wing: Alliance ; names of other cruisers in the same game. 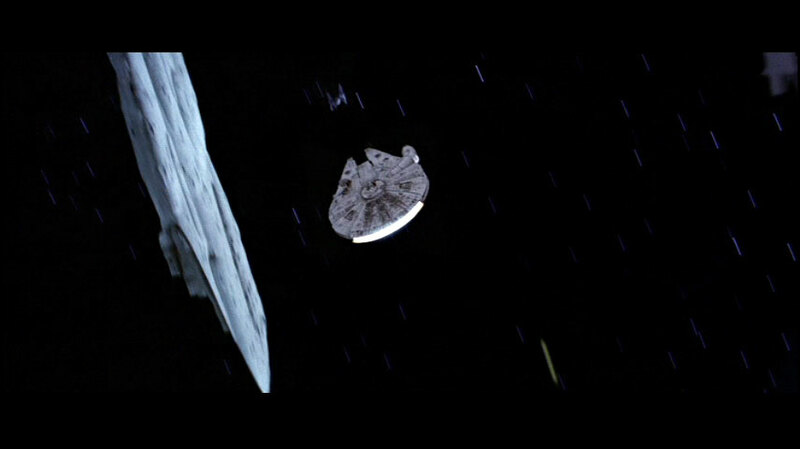 Brian Young for suggesting investigation of the TIE Interceptor impact; for a clear digitised image of the stern of the pearly-hulled anonymous wingless cruiser; for the screenshots from Behind the Magic ; for the generous donation of the Zipshot digitiser used to obtain many of the movie screenshots. Balance of Power , LucasArts. Cracken's Threat Dossier , Drew Campbell et al., West End Games. Dark Empire Sourcebook , Michael Allen Horne, West End Games. Death in the Undercity , West End Games. Empire at war: Forces of Corruption , Lucasarts, 2006. The Jedi Academy Sourcebook , Paul Sudlow, West End Games. Return of the Jedi Sketchbook , Ballantine. Sandblasted , STAR WARS Tales #4 , Kilian Plunkett & Dave Nestelle, Dark Horse. Starship Battles Preview 1 , Gary M. Sarli & Sterling Hershey, Wizards of the Coast, 19 Oct 2006. The STAR WARS Roleplaying Game , Second Edition Revised and Expanded, Bill Smith et al., West End Games. STAR WARS Rules Companion , West End Games. STAR WARS Trilogy Scrapbook: The Rebel Alliance , Random House. STAR WARS Trilogy Sourcebook, Special Edition , David Avallone et al., West End Games. The Truce at Bakura , Kathy Tyers, Bantam Books. The Truce at Bakura Sourcebook , Kathy Tyers & Eric S. Trautmann, West End Games. Star Wars: X-wing: The Official Strategy Guide , Rusel DeMaria, Prima Publishing. X-Wing: Iron Fist , Aaron Allston, Bantam. Original content is © copyright Dr Curtis Saxton 2006. Online since 13 December 1997. Last updated 28 October 2006.